Biotechnology is a field of applied biology that involves the use of living organisms and bioprocesses in engineering, technology, medicine and other fields requiring bio products. Biotechnology also utilizes these products for manufacturing purpose. Modern use of similar terms includes genetic engineering as well as cell and tissue culture technologies. Biotechnology draws on the pure biological sciences and in many instances is also dependent on knowledge and methods from outside the sphere of biology. Conversely, modern biological sciences are intimately entwined and dependent on the methods developed through biotechnology and what is commonly thought of as the life sciences industry. It has a major application in modern brewing technology which includes the production of whisky, traditional fermented soybean foods bacterial biomass, cheese starters, cheese technology, L glutamic acid fermentation etc. Biotechnology and cell molecular biology have developed and emerged in to a major discipline during last two decades. Biotechnology is also used to recycle, treat waste, microbial treatment and utilization a waste. The growing global demand for biotechnology products, India has rich biodiversity that drives its clinical trials industry and forms a strong base for pharmaceutical research. In recent years, the worldwide biotechnology based products market has grown at an annual average rate of 15%. This book majorly deals with introduction to basic biotechnology, downstream processing in biotechnology, modern brewing technology, industrial chemicals, biochemical and fuels, microbial flavours and fragrances, biodegradation of non cellulosic wastes for environmental conservation and fuel production, landfills for treatment of solid wastes etc. This book also consists of addresses of machinery suppliers, addresses of chemical suppliers, list of universities, conducting Biotechnology courses in the directory section. This is a unique book, concise, up to date resource offering an innovative, adoptive and valuable presentation of the subject. It covers all important biotechnological topics of industrial and academic interests. This book will be very use full for industry people, students, and libraries and for those who want to venture in to manufacturing of biotechnological products. Citric acid or 2-hydroxy-1, 2, 3-propanetricarboxylic acid (77-92-9) was first isolated from lemon juice. Althought it occurs in rather high concentrations in citrus fruits, citric acid is ubiquitous in nature forming as it does an intermediate in the citric acid (Krebs) cycle whereby carbohydrates are oxidized to carbon dioxide. The widespread presence of citric acid in the animal and plant kingdoms is an assurance of it non-toxic nature and it has long been used as an acidulent in the manufacture of soft drinks, as an aid to the setting of jams and in other ways in the confectionery industry. Citric acid is produced either in the anhydrous form or as the monohydrate. The transition temperature between the two forms is 36.6ÂºC. Thus the andhydrous form is obtained by crystallization from hot aqueous solutions whereas the monohydrate is obtained by crystallization at temperature below 36.6ÂºC. Both forms are utilized in commerce. Sales of citric acid worldwide are divided amongst the principal fields of use approximately as follows : food, confectionery and beverages (75%), pharmaceutical (10%) and industrial (15%). In food, sugar confectionery and beverages, citric acid is the most versatile and widely used food acidulent. The use of citric acid as a good acidulent depends in part on its strength as an acid. (At 18ÂºC, K1-8.2 Âµ 10-1, K2 1.77 Âµ 10-5 and K5-10-7, Howerver, its pleasant taste and its property of enhancing existing flavours have ensured its dominant position in this market. Citric acid is able to complex heavy metals such as iron and copper. This property has led to its increasing use as a stabilizer of oils and fats where it greatly reduces oxidation catalysed by these metals. The ability to complex metals combined with its low degree of attack on special steels allows the use of solutions of citric acid in the cleaning of power station boilers and similar installations. The sequestering action of citric acid is also used in the pharmaceutical field, for example in the stabilization of ascorbic acid. Another large pharmaceutical use is based on the effervescent effect it produces when combined with carbonates and bicarbonates, for example in antacid and soluble aspirin preparations. Citric acid is often used as the anion in pharmaceutical preparations employing basic substances as the active agent. Citric acid forms a wide range of metallic salts, many of which are articles of commerce. In terms of volume, trisodium and tripostassium citrates are probably the most important. Trisodium citrate is widely used as a blood preservative, where it prevents clotting by complexing calcium. It is also employed as an aid to emulsification in the manufacture of processed foodstuffs, e.g. cheese. In the areas where there are restrictions on phosphates in detergents trisodium citrate is replacing phosphates in speciality cleaners and heavy-duty liquids. Ferric ammonium citrate is still used in the treatment of anaemia although other iron salts are increasingly preferred. Mixtures of citric acid and its salts have good buffering capacity and are extensively used for this purpose in the pharmaceutical, toiletry and food industries. In a process for the removal of sulfur dioxide from the flue gases of power stations and metal smelters proposed by the US Bureau of Mines, a buffer solution containing principally H2Cit is used as a scrubbing agent. A complex ion, H2CitHSO 2/3, is formed which in a second stage reacts with H2S to produce elemental sulfur. The sulfur is readily separated from the citrate solution which may be recycled. The advantage of using citrate solution which may be recycled. The advantage of using citrate solution in this process is that certain side reactions yielding sulfate and thiosulfate, both giving rise to disposal problems, are substantially inhibited by the citrate. Citric acid esters of a wide range of alcohols are known. In particular the triethyl, tributyl and acetyltributyl esters are employed as non-toxic plasticizers in plastic films used to protect foodstuffs. Monostearyl citrate can be used instead of citric acid as an antioxidant in oils and fats. It is more easily incorporated than the free acid, and an improved method or preparation has been devised in the authors' laboratories. Surface fermentation using beet molasses ; (ii) submerged fermentation using beet or cane molasses or glucose syrup. Submerged processes using sucrose as carbohydrate source are also belived to be running in areas where sugar is cheap. Submerged fermentation using beet molasses or glucose syrup. Both beet and cane molasses are very variable in quality both from season to season and from refinery to refinery. In spite of many investigations no clear reasons for this has emerged. Probably because the composition of molasses is so complex. It is necessary, therefore, to make a selection of available molasses on the basis of performance. In order to obtain good yields of citric acid, particularly when A. niger is used, it is especially important to keep available levels of heavy metals, including iron and manganese, below certain critical levels. This is done in molasses media by making additions of sodium or potassium ferrocyanide. Other inorganic nutrients are supplemented where necessary but most inorganic nutrients are already present in molasses. Where glucose syrup is employed as carbohydrate source heavy metals are removed by ion exchange. Pretreatment of sucrose-based media by additions of ferrocyanide have also been proposed. In processes where pure glucose or sucrose is used as the substrate, additions of nitrogen, phosphate and other essential nutrients are made. The yield of citric acid in the fermentation of expressed as kg citric acid monohydrate per 100 kg carbohydrate supplied. Yields in the range 70-90% on this basis have been reported. It should be mentioned that the theoretical yield of citric acid monohydrate from sucrose assuming no carbon is diverted to biomass, carbon dioxide or other by-products is 123% and that from anhydrous glucose is 117%. Thus up to about three quarters of the supplied carbon is converted to citric acid in a good fermentation. The surface fermentation using A. niger with beet molasses as raw material is still extensively employed by major manufacturers. Although somewhat labour intensive, the power requirements are less than in the submerged fermentation. Bucause citric acid manufactures keep their methods secret, little authorative material has been published. Beet molasses is diluted with water to a suitable sugar concentration, e.g. 150 kg m-3, and the pH adjusted. An initial pH of 5 to 7 is usually employed because A. niger will not germinate at higher hydrogen ion concentrations. This effect was unknown when media based on sucrose were being used and starting pH values as low as 2 were in some cases employed. The lack of germination in molasses at low pH is ascribed to the presence of acetic acid, which is a normal constituent of molasses. It appears that unionized acetic acid is the species that prevents the germination, acetate being harmless in this respect. Hence the effect of pH. Additional nutrients and alkali ferrocyanide are then added, and the whole boiled or otherwise sterilized. After cooling, the prepared medium is run down into a series of trays supported on racks in a ventilated chamber. The trays, which are usually made of very high purity aluminium, are filled to a depth of between 0.05 and 0.20 m.
Spores of A. niger are obtained by growing a selected strain on a sporultion medium. The spores are collected and distributed over the surface of the medium in the trays. Sterile air is supplied to the fermentation chamber. The air performs the dual function of supplying oxygen and carrying away fermentation heat and the rate of flow of the air is regulated accordingly. A temperature in the region of 30ÂºC is often employed. The mycelium forms a coherent felt on the surface of the liquid becoming progressively more convoluted. The removal of the heavy metals by the ferrocyanide severely restricts sporulation. After a period of 7 to 15 days the trays are emptied, the mycelium being at the same time separated from the fermented liquor. The liquors are pumped forward to the recovery section. Unwanted by-products of the process are gluconic and oxalic acids. As indicated above there are a number of variants of this process. 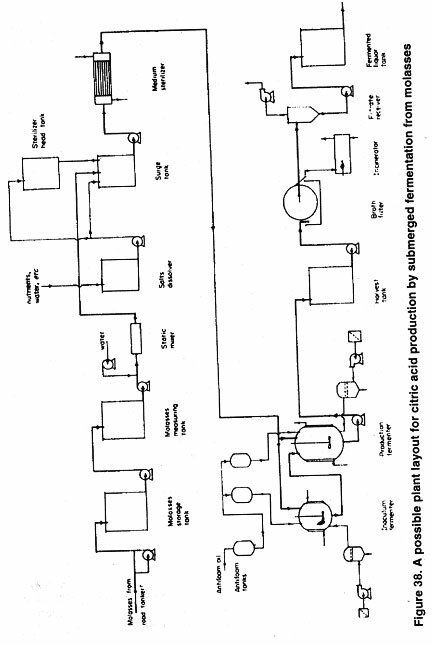 Figure 38 is a flow diagram of the fermentation layout of a possible citric acid plant which consists of a medium preparation section, a fermenter section and a section for separating the fermented liquor from the organism. The medium preparation (suitable in this case for molasses) shows an in-line sterilization step, but sterilization of the medium in the fermenters is a possible alternative. Where in-line sterilization is used the fermenters are sterilized separately using steam at not less than 1 bar. In the plant shown, a vegetative inoculum stage is used where spores of A. niger are allowed to germinate in an inoculum medium before being transferred to the main fermentation medium in a larger vessel. In some processes the spores are introduced directly into the main fermentation but in all cases the inoculum stage, or the initial growth stage in the main fermentation. The morphology of the mycelium at this point is crucial according to many reports, not only in relation to the shape of the hyphae themselves, but also in the aggregation of the growth into small spherical pellets. Thus the hyphae should be abnormally short, stubby, forked and bulbous. This state of affairs is brought about by a deficiency of manganese in the medium or the obviously related additions of ferrocyanide ion. The mycelial pellets should be small (0.2 to 0.5 mm) with a hard, smooth surface. Factors leading to the production of such pellets are correct ferrocyanide level, an ion concentration of less than 1 p.p.m., adjustment of pH, adjustment of aeration and agitation, concentration of manganese and amount of spore inoculum. Whether the aggregation of the deformed hyphae into pellets is really necessary is doubtful, especially when stirred fermenters are being used, but the pellet form does give a broth that is more readily mixed. Where a separate inoculum stage is employed, a suspension of spores of A. nigar, usually grown on a solid medium, is introduced into sterilized medium in the inoculum fermenter. The medium is aerated and, in some processes, agitated and the mould allowed to grow at a temperature of about 30ÂºC for a period of from 18 to 30 hours as judged by pH level reached or in other ways. The fermentation medium is prepared and transferred to the main fermenter and the grown inoculum incorporated at the rate of about 1 m3 inoculum to 10 m3 fermentation medium. Where the inoculum or fermentation medium is based on molasses the initial pH is normally in the range 5 to 7. As mentioned above, most A. niger strains do not germinate or grow at lower pH values in this type of medium. On the other hand lower initial pH values can be tolerated in glucose-or soucrose-based media, and are often used with advantage. There is a lesser chance of infection by adventitious organisms. The fermentation is conducted at about 30ÂºC. Two types of fermenter are in common use, namely the stirred, aerated, baffled tank and the aerated tower fermenter which has a much higher aspect ratio than the former and often contains an internal draught tube to promote circulation. Both types are constructed of high grade stainless steel and have provision for cooling. Both designs are sparged from the base with sterile air, although extra oxygen is sometimes used in the tower type. Sometimes superatmospheric pressure in the fermenter is used to increase the oxygen solution rate. The effect of dissolved oxygen tension (DOT) on the citric fermentation has been studied measuring electrodes are usually provided. The kinetics of the citric acid fermentation with A. niger have been reported. A growth phase is followed by a citric acid producing phase during which only a small amount of growth occurs. In 1965 Tabuchi field a patent for the manufacture of citric acid from technical glucose and molasses in which the organisms claimed were eight genera of yeasts including Candida. The fermentation was carried out at a neutral pH maintained by incorporating calcium carbonate in the medium. A further patent reports yields of about 65% from blackstrap molasses containing calcium carbonate using strains of Candida oleophila. However, it was soon found that a limitation of citric acid yield was the production of quantities of L-(+)-isocitric acid. Efforts were made to select yeast strains not having this defect. Scientist selected Scientist subspecies of Candida guilliermondii producing only small amounts of isocitrate. Claimed a method of obtaining mutants of yeasts giving negligible quantities of isocitric acid wherein the mutants were selected for an inability to grow on media containing a halocitric acid or a precursor thereof. A mutant of Debaromyces calussenii producing a 73% yield from glucose was obtained. Scientist claimed the use of mutants of species of Candida (e.g. C. zeylanoides) requiring a higher iron content in the medium than the parent. Science claimed the use of strains of Candida, Endomycopsis, Torulopsis, Hansenula and Pichia grown in a molasses medium containing Âµ-chloro- or Âµ-fluoro-substituted lower alkanoic mono- or di-carboxylic acids or their water soluble salts or amides such as fluroacetate or fluroacetamide. Scientist proposed to cultive species of Candida in media containing glucose or blackstrap molasses to which 1.5 kg m-3 lead acetate had been added, obtaining thereby higher yields of citric acid. Additions of lead acetate, together with either n-hexadecy citric acid or trans-aconitic acid have also been proposed. By using strains of osmophilic yeasts, initial concentrations of sugar as high as 280 kg m-3 may be employed. In this particular process no pretreatment of medium prepared from crude carbohydrates to remove metal ions is apparently necessary. Calcium carbonate, lead acetate and fluoroacetamide are also added as before. A continuous fermentation process for the production of citric acid from blackstrap molasses using Candida guilliermondii has been described. The advantages of using a yeast, rather than A. niger, are the possibility of using very high initial sugar concentrations, together with a much faster fermentation. This combination gives a high productivity per run, to which must be added the reported insensitivity of the fermentation to variations in the heavy metal content of the crude carbohydrates that are often used for economic reasons. Fermenters of the tower type previously described are suitable, but more effective cooling is required because of the rapid rate of heat output during the shorter fermentation. The broth is harvested when citric acid accumulation has become uneconomically low. The growth of A. niger requires, as would be expected, in addition to a source of carbon, supplies of nitrogen, phosphate, potassium, magnesium and sulfur. In addition, small quantities of zinc, iron, copper and manganese are necessary, as well as olybdenum if nitrate is to be metabolized. When a sufficiency of these nutrients is available the mould grows to its full extent finally entering a sporulation phase. In order that citric acid accumulation can occur to the extent required by a commercial process, neither full growth nor sporulation must take place. This implies a limitation of nutrients. Researchers grew a mould of the A. niger group in continuous culture. They found a sharp maximum of citric acid production at 0.8 kg m-3 NH4NO3 and concluded that nitrogen limitation was an essential requirement for citric acid production. However, demonstrated that cultures otherwise conditioned to citrate accumulation moved out of the growth phase when phosphate was exhausted even when nitrogen was not limiting. Probably either nitrogen or phosphate limitation of effective in inducing citric acid production depending upon strain and other conditions. The positive effect of phosphate limitation would explain the successful use of beet molasses which contain relatively large amounts of metabolizable nitrogen. The importance to the citric acid fermentation of the correct levels in the medium of the trace elements zinc, iron, copper and manganese has long been appreciated. Optimum additions of iron and manganese were found to be necessary for best citric acid yields and the optima varied from strain to strain. Using a purified glucose medium and the well-known A. niger Wisconsin 72-4 additions of 0.3 p.p.m. zinc and 1.3 p.p.m. iron were optimal. Additions of manganese at any level reduced the yield. Researchers found that manganese carried over in spores, when these were produced on a medium containing manganese, was sufficient to reduce citric acid yields. The importance of the zinc, iron and manganese concentrations in the medium thus explains the necessity for the ion-exchange purification of glucose solutions or the treatment of molasses with ferrocyanide ions. Scientist have examined the effect of temperature and pH on the precipitation of iron, copper and manganese from molasses solutions. Scientist found that additions of as little as 1 p.p.b. manganese to ferrocyanide-treated beet molasses reduced the yield of citric acid by 10%. Scientist concluded that ferrocyanide ion directly inhibited mould growth as well as removing unwanted heavy metals from molasses. Researchers found that a small excess of free ferrocyanide in the medium after removal of metals led to increased yields are reached the same conclusion. Figure 39 shows a slightly simplified version of the various enzymatic reactions relating to the synthesis and breakdown of citric acid. Early 14C tracer experiments under conditions giving only moderate yields of citric acid had led to the conclusion that 40% of the acid was produced by a C2, C2 condensation, and 60% via a C1, C3 condensation. Moreover, nearly 40% was produced from recycled C4 acids. Using glucose-3, 414C under good yielding conditions they showed that a near quantative recovery of the labeling was obtained in carbon 4 of the citric acid. Carbon 6 had a specific activity of about 15% of the original. None of the other carbons was labeled to any significant degree. It was concluded that there was no recycling of C4 acids and that the citric acid was formed by an initial symmetrical 3 : 3 split of the glucose and that decarboxylation of one fragment produced a two-carbon compound and finally citric acid was produced by condensation of the two-and four-carbon moieties. Carbon introduced by carboxylation was carbon 6 the specific activity having been diluted by the carbon dioxide pool in the hyphal cells (see Figure 39). The previous section has considered tracer evidence and other matters in relation to citric acid accumulation by A. niger but some enzymatic evidence was inevitably adduced. Further evidence of enzymatic activity during the citric acid fermentation together with aspects of the regulation of these activities under conditions of high citric acid yield will now be considered. The enzymes of this pathway are well attested in A. niger. The aldolase of A. niger requires zinc for activity and this may explain the often explain the often expressed need for zinc in the fermentation medium. Citrate is a known feedback inhibitor of phosphofructokinase (PFK) and mitigation of this inhibition is obviously required for good citric acid accumulation. Scientist has studied the inhibition of PFK by citrate in a high yielding and a low yielding strain of A. niger. She found that the enzyme from the low yielding strain was greatly inhibited by addition of 5.5 mm citrate, whereas the enzyme from the high yielding strain was slightly activated under the same conditions. Researchers have shown that under manganese deficiency, an accumulaton on NH+4 ions occurs in the cell during citric acid production and that condition has the effect of antagonizing the inhibition of PFK by citrate. Citric acid is formed by the condensation of acetyl coenzyme A and oxaloacetic acid under the influence of citrate synthase. Normally the oxaloacetate is provided by the operation of the citric acid cycle. When citric acid accumulates, the cycle is to a greater or lesser degree blocked and another, so-called anaplerotic, reaction is needed to supply the oxaloacetate. This anplerotic reaction is the carboxylation of pyruvate by pyruvate carboxylase. It has been shown that CO2 fixation does indeed occur and pyruvate carboxylase has been isolated from A. niger. The enzyme required no acetyl coenzyme A but was inhibited by aspartate. Since Âµ -ketoglutarate dehydrogenase is practically absent during citric acid accumulation aspartate concentrations must be low and inhibition minimal. Citric synthase (Figure 39) has been studied and found that it was poorly regulated and that citric acid formation was related only to the oxaloacetic acid available. Since both citrate synthase and pyruvate carboxylase are not effectively regulated, the rate of citric acid formation is related to the speed at which carbohydrate is converted to pyruvate. Citric acid is normally catabolized via and citric acid cycle. The first step in this series of reactions, conversion to a mixture of aconitic and isocitric acids, is mediated by aconitase (aconitate hydratase) (ACH). By using the high yielding strain Wisconsin 72-4 was unable to detect ACH under citric acid accumulating conditions. Additions of manganese reduced the citric acid yield and caused the appearance of ACH (there was some evidence that two aconitases were present). Scientist using a ferrocyanide treated beet molasses medium observed the disappearance of ACH during citric acid production, it did not disappear altogether. This was in contrast with citrate synthase which maintained its level almost throughout. Scientist demonstrated the activation of A. niger ACH by iron. Twenty times the optimal level doubled the ACH activity in a mutant of Wisconsin 72-4 but reduced the yield only by a factor of 0.75. The citric yields she obtained were, however, not good and her conclusions on the relation between ACH levels and citric acid production should be treated with caution. Overall, the effects of Mn and of Fe on the presence and activity of ACH accord well with experience of the fermentation. Isocitric dehydrogenase (ICDH) and isoctric lyase (ICL) break down isocitric acid. ICL has been shown to be absent from A. niger when citric acid is accumulating. The case of ICDH is more complex, there being two enzymes with NADH and NADPH specificities. The NADH enzyme is cytoplasmic whereas the NADPH enzyme is located in the mitochondria and is inhibited by physiological concentrations of citrate. Scientist considers the possibility that the inhibition of mitochondrial ICDH by citrate causes isocitrate to accumulate and since isocitrate is in equilibrium with a much higher concentration of citrate under the influence of ACH, citrate will also accumulate. However, since only low or zero ACH activities have been detected during citric acid accumulation it is difficult to agree with this conclusion. Moreover, although there is an equilibrium between citrate, isocitrate and aconitate in the presence of ACH, isocitric acid (or aconitic acid) is not found as an impurity of citric acid made with A. niger. The situation when yeasts are used is of course very different. It is possible that the permeability of the mitochondria in A. niger in much greater for citrate than isocitrate. Whether glucose or n-alkanes are used as substrate the fermentation pattern shows a growth phase followed by an acid accumulation phase, the transition being brought about by nitrogen limitation. When n-alkanes are used as substrate they are converted by b-oxidation to acetyl coenzyme. A which is combined with oxaloacetic acid in the usual way (Figure 39). It is thought that when glucose is used as substrate pyruvate carboxylase provides the anaplerotic reaction as in A. niger. However, when n-alkanes are the substrates, anaplerosis is provided by the glyoxylate cycle, and this is reflected by a higher level of ICL. At the same time the levels of ACH are higher than when glucose is being utilized. A problem with the yeast process is the very high ratios of isocitric acid to citric acid which are produced in some cases. These ratios are much higher than the equilibrium values mediated by ACH. It has been suggested that a selective transport of isocitric acid from the mitochondrion to the cytoplasm occurs. Removal of the fermenting organism from the final broth leaves an aqueous solution of citric acid contaminated by various organics and inorganics depending on the initial carbon source. The classical citric acid recovery process, which is particularly suitable for use with the very impure liquors derived from molasses, is to heat the fermented liquor and add lime. The insoluble calcium citrate tetrahydrate is precipitated (Figure 40). The washed precipitate is treated in aqueous suspension with H2SO4 yielding an aqueous solution of citric acid and a precipitate of by-product CaSO4 (gypsum). This set of operations has the effect of removing most of the impurities, either those derived from the substrate or those generated in the fermentation. 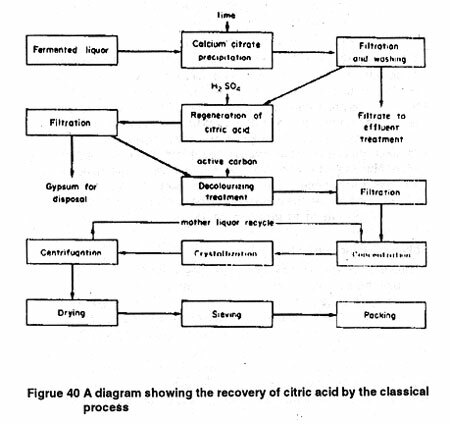 Figure 40 shows a sequence of steps leading to packed saleable citric acid. As mentioned above, the conditions of the concentration/crystallization steps can be varied to produce either the anhydrous acid or the monohydrate. Solvent extraction is possible alternative to the classical method but, because the available solvents tend to extract some of the impurities contained in molasses-derived liquors, it is easier to apply to the products from glucose or alkane-based substrates. The advantage of the solvent extration method is that it avoids the use of lime and H2SO4 and the concomitant problem of gypsum disposal. Scientist proposed the use of butan-2-ol as an extractant. Later it was claimed that tributyl phosphate diluted with a minor amount of kerosene could be used. In this process a better recovery could be realized by extracting the citric acid into the solvent at a low temperature, subsequently stripping the solvent with hot water. Further details of a process of this type which can be carried out in mixer-settlers or centrifugal extractors are given. Another variant of the solvent extraction process is the ion pair extraction system in which the extractant consists of secondary or tertiary amines having in total at least 20 carbon atoms dissolved in a water immiscible solvent. Again the extraction of the citric acid from the fer mented liquor is done at a lower temperature (Â£ 20ÂºC) and the stripping state at a higher (Â£ 80ÂºC). It is believed that this process has been licensed to Miles Laboratories Inc. Who have secured FDA approval for the use of a mixture of tridodecylamine, octyl alcohol and isoalkanes. A further development of this process is the use of N-substituted alkyl amides as extractants. In fermentations with n-alkanes and in particular where sodium hydroxide is used for pH control, monosodium or trisodium citrate can be directly crystallized from the clarified fermented liquor. In this case citric acid may produced from the sodium citrate by electrodialysis. Reference has already been made to the production of gypsum in the calcium citrate precipitation method of citric acid recovery. The disposal of this solid waste can pose a problem. A more serious problem is the disposal of the filtrate from the calcium citrate precipitation, especially where molasses is used as the starting material. This waste, although non-toxic, has a very high oxygen demand which makes it unacceptable in rivers without treatment. Scientist have proposed the cultivation of yeasts on the effluent producing a material suitable for animal feed. Another possibility is to evaporate the effluent to produce a concentrated molasses - like material usually called condensed molasses solubles (CMS). This material can be used in feedstuff formulations. Another method of treatment is anaerobic digestion which has the advantages of producing a fuel gas as a by-product. The current world market for citric acid (and its derivatives) is upwards of 3,00,000 tonnes per annum and it may be regarded as a mature product, although an upward trend in its usage may be expected to continue. This trend will include additional sales as an acidulent for food use as well as an increasing quantity for uses where its complexing properties are required. Its use as a biodegradable substitute for polyphosphates in detergents has not developed except in a few areas with special problems. In part this is due to price considerations. A decrease in fermentation recovery costs could change the situation, and further developments in the newer methods such as solvent extraction in its widest sense can be expected. In the case of the fermentation stage, although most manufacturers already possess high yielding strains, scope for some further improvement probably remains, particularly in relation to the shortening of fermentation times. Mutagenic treatment of the organism followed by selection is still the normal mode of new strain development, although the selection process is made less cumbersome by use of replica plate cultures and selection pressures. Whether the methods of gene transfer will be applicable to the citric acid fermentation in the near future is doubtful. In the present state of the art, gene transfer techniques are very powerful where the desired products are single peptides or proteins. In a 10-stage conversion such as that from glucose to citric acid, progress could only be made by identifying limiting steps and improving the flow of metabolites through these. Unfortunately, at the present time, the knowledge of the metabolic steps and of the genetics of the organisms involved is somewhat wanting in detail. Vinegar, that is aqueous solutions of acetic acid used as a condiment and in picking, has been known and consumed for as long as the art of wine making has been practiced and therefore dates back to at least 10000 BC. Apparently the earliest records which refer to vinegar are the Old and New Testaments; vinegar is said to have been offered as a drink to Jesus. The Bible describes vinegar as a popular nostrum and one of the important compounds of alchemists. The word vinegar is derived from two French words, viz. vin (wine) and aigre (sour); the Latin word acetum means literally sour or sharp wine. So, it can be assumed that the first vinegar used by ancient peoples was simply spoiled wine. Early methods obtained acetic acid from natural carbohydrates by biochemical oxidation of alcohol and destructive distillation of wood. Vinegar may be produced from a wide variety of raw materials, e.g. apples, malt, grapes, grain, molasses, pears, peaches, oranges, whey, pineapples, and other fruits, the main requirement being a satisfactory, economic source of alcohol and accessory flavouring constituents; the term vinegar is applied to the product of acetous fermentation of ethanol from any of the above mentioned sources. Today acetic acid is an important industrial organic chemical with approximately 2.45 million ton/year being produced and consumed world wide, half of it in the USA. 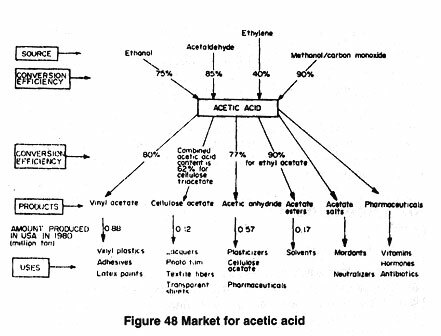 It ranks 34th amongst all chemicals produced and its use is considered to be the fastest growing amongst the important of acetic acid can be understood from Figure 48 which illustrates the market for it. Since 1950 synthetic methods have provided the major part of the world's acetic acid supply. Because it was possible for a time to hold the price of organic chemicals derived from fossil fuels within certain limits, despite a steep rise in the cost of crude oil, the need to find alternative methods of production, such as by biological routes, did not arise. The current shortfall in supply appears to be an incentive for more serious consideration of the revival of biological routes. The kinetic behaviour of acidogenesis depends on the source of microflora and the type of substrate used. Very little information is available on the kinetic behaviour of acid-formers in the absence of methanogens. Most studies are known to have been carried out with the simultaneous production of methane from acids produced by acid-formers. The effect of termperature, pH and initial substrate concentration on acid production and yield have been studied in a continuous multireactor system with cell recycle (Figure 49) using sucrose as substrate and inoculum isolated from a municipal sludge digester. 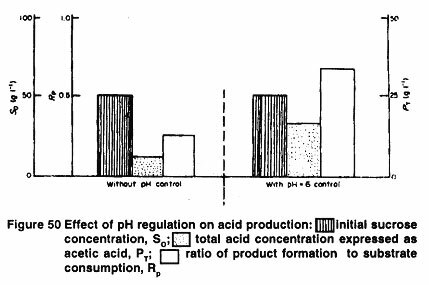 Control of pH at 6 results in a significant increase in acid production compared to no control of the pH system (Figure 3). The concentration of propionic acid decreases when the temperature increases and at 40ÂºC there is no propionic acid. Since at this temperature the toxic effect of organic acids decreases, it appears that propionic acid exercises increased toxic effects relative to acetic and butyric acids. The amount of butyric acid increases at higher temperatures. The empirical approach to the manufacture of vinegar from an alcoholic mash has been known for a long time. Vinegar had been produced by natural fermentation in the Orleans region of France long before the discovery of acetic acid bacteria. The biological nature of 'mother of vinegar' was first suggested by Boerhaave, reported a bacterial study of 'mother of vinegar' and named the film appearing on the liquid layer 'Mycoderma'. The acetic acid bacteria belong to the family Pseudomoadaceae. The cells are rod-shaped, but elongated, swollen or branched forms may occur. They may be motile or non-motile; they do not form endospores. The species which do not convert ethanol to acetic acid are either peritrichous flagellate (Acetobacter aceti) or non-flagellate (Acetobacter rancens). The young cells are Gramnegative in character while the older ones are Gram-positive. The idea that vinegar can be produced rapidly by trickling wine through packed pumice was discovered by Boerheave in the early part of the nineteenth century. It was improved by Schuzenbach to make it the 'quick process', also known as the 'German process', which is the basis for modern methods of manufacture of vinegar using a generator. The generator consists of a wooden or metal-coated tank packed with beech wood shavings on which cells are allowed to grow. The feed trickles from the top through the wood shavings. A large volume of air is sparged into the tank though perforations in the bottom. Empolying 12% (v/v) alcohol, 98% conversion into acetic acid is attained in 5 days by this process. This process has been used for the commercial production of vinegar for about a century. The application of submerged fermentation to the oxidation of ethanol to acetic acid was the next technical advance in the commercial production of vinegar. They noted that Acetobacter species in submerged conditions were very sensitive to oxygen deficiency and that the fermentation stopped when the level of oxygen in the gas phase was less than 5%. The success of this process depends largely on the efficiency of the aeration of the broth. The acetic acid bacteria during submerged exponential fermentation have no average oxygen uptake rate of 7.75 O2 kper gram cell per hour. 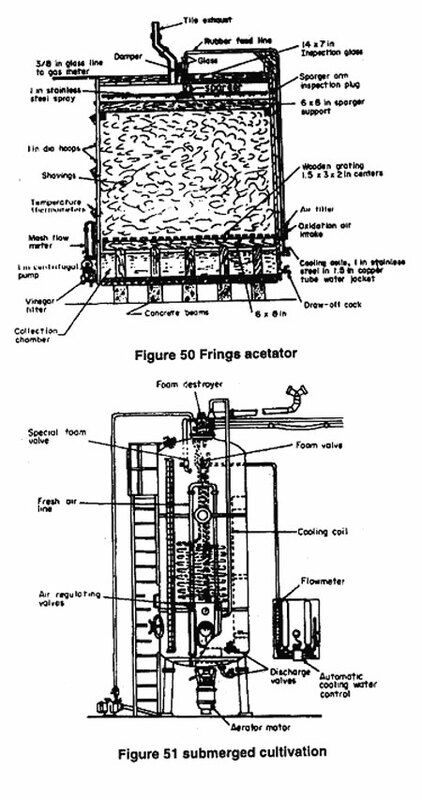 The advantages of submerged cultivation (Figure 51) over the trickling generator are : (1) the submerged cultivation permits 30 times faster oxidation of alcohol; (2) a smaller reactor volume is needed (about 16% of the trickling generator) to produce an equivalent amount of vinegar; (3) greater efficiency is achieved; yields are 5-8% higher and more than 90% of the theoretical yield is obtained; (4) the process can be highly automated; and (5) increased economy owing to the elimination of clogging by shavings, interruptions, etc. The ratio of productivity to capital investment is much higher in the case of submerged cultivation. After the discovery of submerged acetification, a number of processes were developed, viz. (i) Yeomans cavitator (1967), in use in the US and Japan; (ii) the Bourgeois process used in Spain and Italy; and (iii) the Fardon process, used mainly in Africa for making malt vinegar. These processes were not used extensively on a commercial scale. The application of immobilized cell techniques for the production of acetic acid dates back to the early part of the nineteenth century, but little has been done to improve the process into an efficient technology. Only recently has considerable emphasis been placed on the immobilization of whole cells. A variety of immobilization techniques and carriers have been reported but there is no ideal or universal method. Factors to be considered include the organism, the product(s) formed and the diffusion characteristics of the system. The general methods of immobilization are adsorption on a carrier; convalent attachment to a carrier; encapsulation within a confinement or gel entrapment; and cross-linking of cells within the carrier or between cells in the absence of a carrier. Live immobilized microbial cells have been used for multienzyme reactions such as alcohol production but aerobic reactions involving large oxygen requirements like acetic acid production pose problems of mass transfer. Production of vinegar by live cells of Acetobactor acetic immobilized on fibrous and other carriers has been studied. Both adsorption and covalent binding techniques were employed for the cell immobilization. The performances of the carriers in terms of cell loading and productivity in batch experiements are summarized in Table 32. In terms of cell loading, PVC, bagasse and rice husks appear to be better, but the rate of acetic acid production is higher in the case of inorganic materials. Substrate concentrations above a level of 10% are inhibitory to product formation. 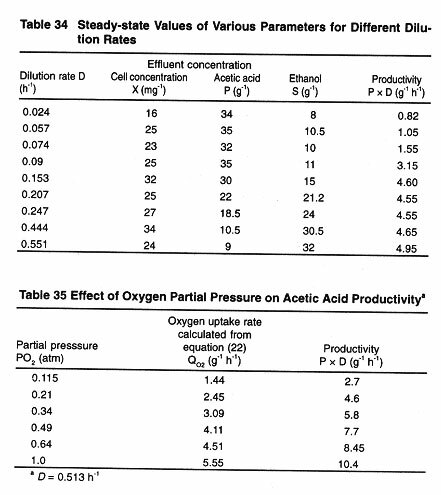 The effect of initial ethanol concentration on productivity is shown in Table 33. Comparison of the growth of cells in free and immobilized states shows considerable differences. The mm values for free and immobilized cells were estimated as 0.25 h-1, respectively, and the corresponding cells yields were 0.104 and 0.008, respectively. Both oxygen uptake and carbon dioxide evolution rates are higher in free cells than in immobilized cells but the respiratory quotients for both the systems remain almost the same. According to Kennedy in the case of Acetobactor aceti immobilized on an adsorbed Ti/Zn hydroxide bed (supposedly having partial covalent binding) the oxygen consumption takes place at a rate 30% of that used by free cells. An activity decay profile of the immobilized Acetobacter follows first order kinetics and the half-life of these cells is computed as 378 h.
Recently, a modification of the tubular reactor (tower fermenter) has been applied to the acetification of alcoholic mash and a volumetric efficiency of up to 1.0 fermenter volume output per day has been achieved; this is 100% higher than the performances of the Frings process. In a highly aerobic acetic acid fermentation, the mass transfer and two-phase flow phenomena are the dominant features of the fluidized bed tower. Generally the overall rate is limited by the rate of oxygen transfer from the air bubbles into the liquid phase. The use of a tower bioreactor reduces loss of alcohol due to evaporation. It has been reported that at an aeration rate of 0.5 vvm in a stirred tank reactor, the loss of alcohol in 48 h using 5% alcohol is nearly 28%, whereas the loss becomes about 50% at an aeration rate of 1 vvm. On the other hand in a tower fermenter very little loss due to evaporation is observed in 48 h. The loss of alcohol ultimately lowers the yield in a stirred tank by about 27% compared to a tower reactor. According to Kennedy Acetobacter species which produce extracellular polysaccharides aggregate in the presence of hydrous titanium (IV) oxide thereby enabling a higher medium flow rate and a subsequent increased acetic acid output to be achieved. 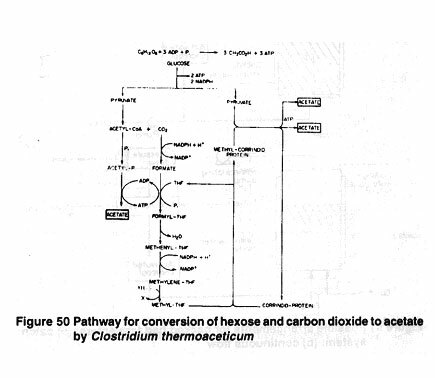 Strains of Acetobacter which cannot produce polysaccharides do not give this effect with hydrous Ti(IV) oxide but produce more acetic acid when a Ti(IV)-cellulose chelate is added to the system. The mechanism which results in a better performance by extracellular polysaccccharide-forming cells is believed to be as described below. In the oxidative conversion of ethanol to acetic acid, delivery of oxygen from the gas phase to the bacteria can be described as occurring in three stages. First, oxygen (from air) has to dissolve in the liquid medium; the saturation concentration (9 p.p.m.) being very low, the dissolution of oxygen can obviously become limited by the rate of supply of air to the fermenter. Second, the dissolved oxygen has to diffuse through the liquid to the bacteria, and finally the oxygen has to enter the bacterium and participate in the oxidation reaction. Using Acetobacter aceti the overall mass transfer coefficient, KLa, was found to be 4200 m-1 in a pulsed reactor, the high value of KLa reflects the high oxygen transfer efficiency of the pulsed flow, also observed. 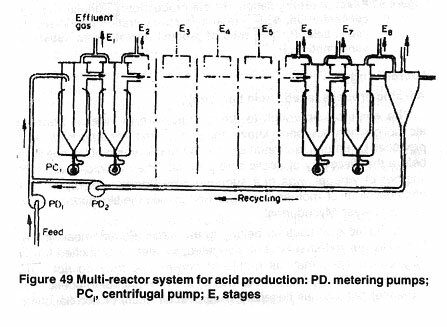 Diagrams of a pulsed immobilized reactor, a tower reactor and chemo stat cultivation are presented in Figure 4. 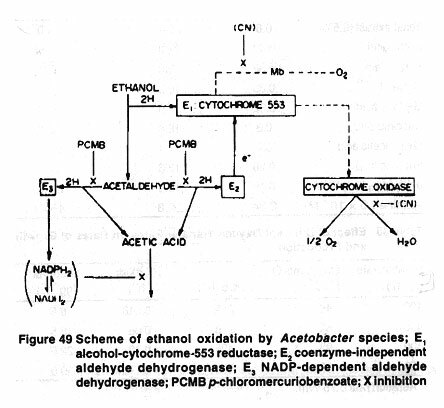 This oxidation of ethanol by Acetobacter is a two-step process: the first is a partial oxidation of ethanol to acetaldehyde and the second completes the oxidation of acetaldehyde to acetic acid. Under anaerobic conditions 1 mol of each of ethanol and acetic acid. Under anaerobic conditions 1 mol of each of ethanol and acetic acid are produced from 2 mol of acetaldehyde by the Cannizaro dismutation reaction; 1 mol of ethanol is formed by hydrogenation of acetaldehyde and one of acetic acid by oxidation of acetaldehyde equation 1. Since it is reported that acetic acid is also formed in the absence of oxygen but in the presence of hydrogen acceptors like methylene blue and benzoquinone, it was concluded that acetic acid was formed by the action of dehydrogenases. It is assumed that hydrated acetaldehyde is formed as an intermediate. In the first step alcohol dehydrogenase and in the second acetaldehyde dehydrogenase are involved as shown below : equation 2. From the results of various studies and related reports, Nakayama postulated the scheme shown in Figure 49 for oxidation of ethanol by Acetobacter species. Ethanol is first oxidized to acetaldehyde by E1, which is reduced by the libterated electrons; the acetaldehyde thus formed is further oxidized either by E2, when liberated electrons are delivered to E1, or by E3 when NADP is reduced to NADPH2. Reduced E1 is then oxidized by a cytrochrome oxidase. On the basis of inhibition effects by cyanide and PCMB, it is presumed that the cytochrome system is driven in the ethanol and acetaldehyde oxidation by E1 and E2, whereas the NADPH2, produced by E3 inhibits further oxidation of acetic acid through the TCA cycle by changing the equilibrium NADPH2 ] NADH2. The important of the addition of yeast extract to the medium with regard to higher ethanol tolerance and higher productivity has already been discussed. It has another important effect, viz. shortening of the lag phase in acetic acid fermentation. 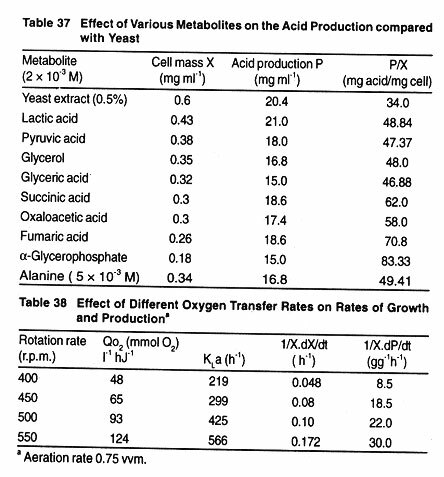 Lactic acid, pyruvic acid, glycerol, glycenic acid, a-glycerophosphate, alanine, succinic acid and furmaric acid are reported to exercise such effects; decreased lag effect is accompanied by an increase in the ratio of acid produced to cell growth (Table 5.) implying that the flow of metabolism in cells is changed in favour of acetic acid production rather than cell growth. Tetracocus soyae, a homofermentative lactic acid bacterium, can utilize glycerol as an energy source only under aerobic conditions and both growing and resting cells produce acetic acid as the end product from glycerol. The acid yield is about 70% and its concentration reaches 12 g-1. Glycerol can be completely dissimilated to acetic acid; lactic acid is produced initially but it readily undergoes oxidative degradation to acetic acid. Glycerol dissmilation is catalyzed by inducible enzymes and cells posses high levels of catalase and cytrochromes. H2O2 produced in the oxidation of L-glycerol 3-phosphate is decomposed by catalase. It has long been recognized that oxidative microbial production of acetic acid is a highly aerobic process. Values of oxygen transfer coefficients for Acetobacter aceti are presented in Table 38. The mixed flora popularly known as acid-formers, which are responsible for the conversion of cellulose to volatile fatty acids, comprise two distinct of bacterial species : celluloytic and non-cellulolytic. The interaction between these two groups in acidgenesis is very complex. Biosynthesis and extracellular cellulase activities are constrained by non-celluloytic organism provide some nutritional inputs such as vitamins, growth factors and branched chain fatty acids necessary for celluloytic species. The first step in acidogenesis is the solubilization of cellulose and hemicellulose. The most active celluloytic species have been shown to be Gram-negative, short rods (Bacteroides sp.) and cocci. The anaerobic cellulase activity of Ruminococcus is partially inhibit enzyme activity but their effect on cellulose biosynthesis is not yet resolved. In spite of their critical role, celluloytic bacteria constitute a small fraction of the total acid formers and the distribution of population depends on the type of waste on which they grow. Formic, acetic, butyric, propionic, lactic, succinic and isobutyric acids are produced from the degration of cellulose. The primary metabolic products of celluloytic bacteria include aliphatic acids (formic, acetic, propionic, butyric, valeric), lactic acid, succinic acid, ethanol, carbon dioxide and hydrogen. In the first reaction the hexose is fermented via the fructose diphosphate pathway to 2 mol of pyruvate of which one is further metabolized pathway to 2 mol of pyruvate of which one is further metabolized to acetate and carbon dioxide; six equivalents of electrons are formed during this process. In the second step, these electrons are used to reduced carbon dioxide to the methyl group which yield 2 mol of acetate in a transcarboxylation reaction involving the carboxyl group of pyruvate formed in the first step. Dynatech workers have successfully fermented aquatic weeds to produce organic acids inhigh yield in a fixed packed bed bioreactor shows batch and continuous fixed bed bioreactors for the production of acid. The liquid is circulated through the loop of the packed bed. Toxic compounds may be removed from the aqueous phase by passing through an activated charcoal cleaner. The acid is removed in an external subsystem by solvent extraction. Fixed packed bed fermenters can improve operating parameters and can remove a number of constraints, like mass transfer, generally faced in conventional digestion systems. Sodium hydroxide pretreatment to increase biodegradability of lignocellulosics by ruminants is well known. The separation of acetic acid from water has been industrially important for many years. The physical methods which have been considered include : (i) fractional distillation; (ii) azeotropic dehydration distillation; (iii) solvent extration; (iv) combination of the above methods; (v) extractive distillation; and (vi) carbon adsorption. As an alternative, to reduce energy consumption azeotropic dehydration, can be employed. In this method a water insoluble 'withdrawing' liquid called the entrainer is added, which decreases the effective boiling point of water relative to that of acetic acid by the formation of a low boiling point azeotrope. Low molecular weight esters such as butyl acetate are generally used as entrainers. 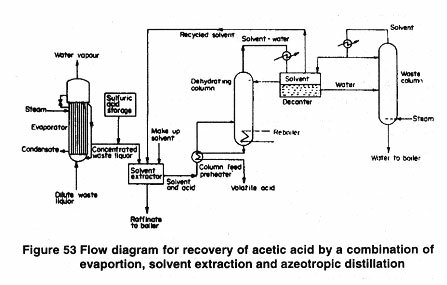 A flow diagram of azeotropic distillation is shown in Figure 52. For intermediate concentrations (10 to 50%), liquid-liquid extration is employed and usually is followed by azeotropic distillation. Low molecular weight solvents (esters, ethers and ketones) have sufficiently high distribution coefficients for acetic acid at low concentrations. Ethyl acetate along with diethyl ether are still considerated to be most efficient extrations. Scientist suggested a combination of extration, azeotropic distillation and possibly extractive distillation for the production Scientist of glacial acetic acid. Amberg modified this proposition and recommended the following steps for the recovery of volatile fatty acids from fermentation liquors : (i) evaporation of the fermented liquor to 40-50% solids, (ii) solvent extraction using methyethyether as solvent; (iii) dehydration and recovery of solvent by azeotropic distillation; and (v) refining 95% acetic acid to the glacial state. A schematic diagram is shown in Figure 53. An economically attractive scheme for the recovery of acetic acid from a dilute aqueous stream by extraction with a hydrocarbon followed by distillation has been developed by Helsel. The extractant used is a high boiling (bp 460ÂºC) trioctylphosphine oxide (TOPO). It is soluble in many polar and non-polar solvents but has a very low water solubility (1 p.p.m.). The four operations of the system are shown in Figure. The inherent advantages of this new technology are : (i) a high distribution coefficient of acetic acid in very dilute aqueous solution allows a small solvent (TOPO) volume to be used; (ii) good phase separation reduces the size of the extration equipment; (iii) the stability and high boiling point of the solvent enable a small volume of acid to be recovered from a much larger solvent flow; and (iv)the low solubility of the solvent in water permits higher selectivity of the solvent and obviates the need for raffinate stripping. These advantages represent significant energy and capital savings compred with other recovery processes, especially when the acetic acid concentration is less than 5%. For 2% acetic acid solution the energy required for recovery is about 15 GJ/ton of glacial acetic acid. To avoid product inhibition in the reactor, a concurrent extration process is required which will remove acetic acid continuously to keep its level below the critical point in the fermenter. The extraction methods suggested are ion-exchange resins, solvent extraction and membrane separation. The oxidized organic impurities are removed with the solvent layer while the MnO4 stays in the water layer and can be reused. Another bottleneck in acidogenesis is the low acid tolerance of acid-formers. This can be improved by injecting acid into the reactor to adapt the crude culture to higher acid concentrations. It has been found that addition of acetic acid at a level of 0.2% increases release by 30%. One of the earliest methods for preparing acetic acid was by destructive distillation of wood to give pyroligneous acid, which contained 10% acetic acid. The acid used to be recovered by solvent extraction and distillation. This method was later replaced by a synthetic chemical process in which energy requirement is about 45% of that required in the wood distillation process. 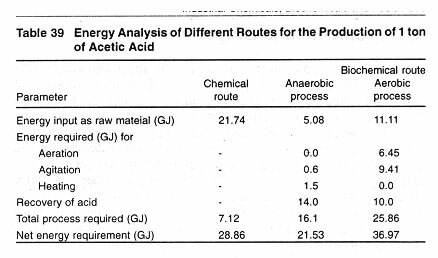 The energy requirements for the production of acetic acid by the following routes can be compared : (i) the chemical route (from acetylene); and (ii) the biochemical route via (a) the aerobic process, (b) the anaerobic process. 26 tons acetylene produce 60 tons acetic acid. The energy diagram for the production of 1 ton of acetic acid is shown below. Although the raw material has a calorific value of 23.55 GJ, the net energy available through incineration is 11.11 GJ. The temperature of fermentation is about 30Âº C, so the energy required for heating can be neglected. The results are summarized in Table 39. Since a higher acetic acid concentration is obtained in the aerobic system than in the anaerobic process, the energy required for the acid recovery is less. Distillery waste has been found to produce acetic acid anaerobically in an appreciable quantity in a very short time (2 days). Basis of calculation : 1 ton acetic acid; distillery waste containing 8% TS (BOD 45000 p.p.m.). In this case no energy is required for aeration but acid concentration is low (about 2%), so much energy is required for separation. The energy requirements for heating, recovery of acid, etc. are shown in Table. Schematic diagram of anaerobic acid production and separation is shown in Figure 54. Lactic Acid (2-hydroxypropanoic acid, 2-hydroxypropionic acid) is an organic hydroxy acid whose occurrence in nature is widesperead. Lactic acid first isolated from sour milk. The chemical and physical properties of latic acid have been extensively reviewed. Lactic acid exists in two optically isomeric forms shown (1) and (2) see Table 45. The homofermentative lactic acid bacteria catabolize 'glucose via the Embden-Meyerhof pathway. Two lactic acid molecules are produced from each molecule of glucose, typically with a yield of better than 90 g per 100 g glucose. Pentose sugars are also metabolized by some homofermentative species sterospecific and lactic acid are the products of this metabolism. Organisms may produce D (-).., L (+).. or DL-lactic acid. The formation of the racemase. The classification of many strains of lactic acid bacteria is still in much confusion at the present. Consequently, it is best to consult the literature on a specific strain or perform an analysis to determine the sterospecificity of the lactic acid it produces. The lactic acid bacteria are extremely limited in their synthetic capabilities. They always require B vitamins and almost without exception require a large number of amino acids. The selection of an organism depends primarily on the carbohydrate to be fermented. L. bulgaricus, L. casei or S. lactis are used to ferment Lactose. Adapted strain of L.delbrecki and L. leichmanni are typically used to ferment glucose. L. pentosus has been used to ferment sulfite waste liquor. Researchers have isolated a homofermentative strain called L. amylophislus which is capable of fermenting starch to L(+)- lactic acid with 90 wt% yields. Mixtures of strains as well as pure cultures have been used for the commercial manufacture of lactic acid. Some fungi of the species Rhizopus Particularly R. oryzae, can be used to produce L(+)-latic acid. This organism has less complex nutritional requirements than the lactic acid bacteria. Yields and fermentation rates of glucose are comparable to those of Lactobacilli. Rhizopus species can also utilize starch feedstocks. The process, however, never achieved lasting commercial success. The use of organisms such as Rhizopus with less exacting nutritional requirements could possibly the feed costs and simplify the recovery process. A large number of carbohydrate materials have been used, tested or proposed for the manufacture of lactic acid fermentation. It is useful to compare feedstocks on the basis of the following desirable quantities: (1) low cost, (2) low levels of contaminants, (3) fast fermentation rate, (4) high lactic acid yields, (5) little or no by-product formation, (6) ability to be fermented with little or no pretreatment, and (7) year-round availability. Crude feedstocks have historically been avoided because high levels of extraneous materials can cause troublesome separation problems in the recovery stage. Use of pentose sugars results in the production of acetic acid which will incur extra process equipment for separation and could potentially become a nuisance from a marketing standpoint. Sucrose from cane and beet sugar, whey containing lactose, and maltose and dextrose from hydrolyzed starch are presently used commercially. Refined sucrose, although expensive, is the most commonly used substrate, followed by dextrose. Not surprinsingly, some lactic acid manufactures are connected with the beet or cane sugar business. Dextrose from corn starch was most commonly used feedstock. Concentrated whey has been used without any other pretreatment. Cellulosic materials such as corn cobs, corn stalks, cottonseed hulls, and straw and sulfite waste liquor have been used. Acetic acid is produced as a by-product from cellulose derived sugars. Batch fermentation has been the method used industrially. Fermenters have been constructed of wood or 316 stainless steel, and equipped with heat transfer coils for temperature control. Minimal agitation is provided by top or side mounted stirrers in order to keep the contents mixed. Fermenters are typically steam heated with water for boiling or chemically sterilized before filling with a pasteurized medium. Often, fermenter covers as loose fitting. Contamination is not a large problem: the most serious contamination problems are due to the growth of butyric acid bacteria at the end of the fermentation. Final product concentrations are due to growth of butyric acid bacteria at the end of the fermenation. Final product concentrations are less than 12-15% depending on the other fermentation conditions to prevent precipitation of calcium lactate. Fermentation conditions are different for each industrial producer but are typically in the range of 45-60Âº C with a pH of 5.0-6.5 for L delbreuki 42ÂºC and a pH of 6-7 for L. bulgaricus, and 30-50ÂºC and a pH below 6 for Rhizopus. The inoculum size is usually 5-10% of the liquid volume the fermenter. The inoculum can be propagated in seed tanks or taken from a completed large scale fermentation. The acid formed is neutralized by calcium hydroxide or calcium carbonate. The neutralizing agent can be added in excess as a slurry at the beginning of the fermentation or added intermittently during the fermentation on the basis of pH or acid titration measurements. The fermentation time is 1-2 days for a 5% sugar source such as whey and 2-6 days for a 15% sugar source such as glucose or surose. Reactor productivities are in the range of 1-3 kgm-3 h-1. Under optimal laboratory condition the fermentation takes one or two days. The yield of lactic acid after the fermentation stage 90-95 wt% based on the initial sugar or starch concentration. The residual sugar concentration is typically less than 0.1%. Cell mass yields can be as large as 30 wt% but generally are less than 15 wt% based on the initial sugar concentration. The yield of cell mass depends heavily on the amount of nitrogenous nutrients used. The fermentation rate depends primarily on the temperature, pH, concentration of nitrogenous nutrients, and the lactic acid concentration. A controlled pH batch fermentation will proceed quickly at first. Minimum cell mass doubling times are about one hour, but these rates are not achieved under industrial operating conditions where the amounts of nitrogenous nutrients are suboptimal. Lactic acid is sold in three major grades : technical, food (FCC) and pharmaceutical (USP). The grades are listed in order of increasing purity and more elaborate recovery processes are needed to produce the higher quality material. In addition, heat stable lactic acid, which does not discolour significantly upon heating to about 200ÂºC for a few hours, has a large market. The recovery of lactic acid or lactate salt from the fermentation broth is a large part of the total cost of manufacture. Synthetically made lactic acid may be purified with less effort and thus in the past has been preferred for uses where heat stability is needed. Materials of construction for fermentation and recovery equipment are limited by the very corrosive nature of lactic acid, and contribute significantly to the products final cost. Iron, copper, copper alloys, steel, chrome steel and nomal are unsatisfactory. Inconel and nickel are better but not recommended. Low iron alloys with large amounts of nickel and chromium corrode at an even slower rate. High molybdenum stainless steels such as 316 SS are satisfactory but still encounter problems, especially at improperly annealed welds and at gas/liquid interfaces where oxygen is present. Silver and tantalum are suitable, but too expensive for general use. In addition to equipment failure, corrosion increases the number of metal ions in the product which must be removed for some end uses. Wood, especially cyress and pitch pine, are satisfactory for dilute solutions but become dried out when exposed to concentrated solutions. Rubber is suitable for low temperature applications. Glass and ceramics are resistant, but their brittleness and poor heat transfer properties limit their usefulness. Some plastics are softened by warm concentrated lactic acid; however, heresite-lined, saran-lined, Teflon-lined and polyester materials have been used. Plasticizer and other additives in plastic acid; however, heresite-lined, saran-lined, teflon-lined and polyester materials have been used. Plasticizer and other additives in plastic and rubber materials may be extracted or decomposed by lactic acid under some conditions. Advances in plastic, rubber ceramic, composite materials and metal alloys may provide some new materials choices with more attractive cost and acid resistance. The first step in all recovery processes is to raise the fermentation liquor's temperature to 80-100ÂºC and increase the pH to 10 or 11. This procedure kills the organisms, coagulates the proteins, solubilizes the calcium lactate, and organisms, coagulates the proteins, solubilizes the calcium lactate, and degrades some of the residual sugars, the liquid is then decanted of filtered. For some purpose, acidification of this liquor yields a usable product; however, for most applications further processing by one of the following methods is required. It should also be noted that use of cheap but impure raw materials must be weighed against higher purification costs. One of the methods for commercially producing lactic acid relies on the fermentation of relatively pure sugars with minimal amounts of nitrogenous nutrients. Thus, by using a pure feedstock the recovery process is simplified. Figure 60 shows the process that was used by process is simplified. 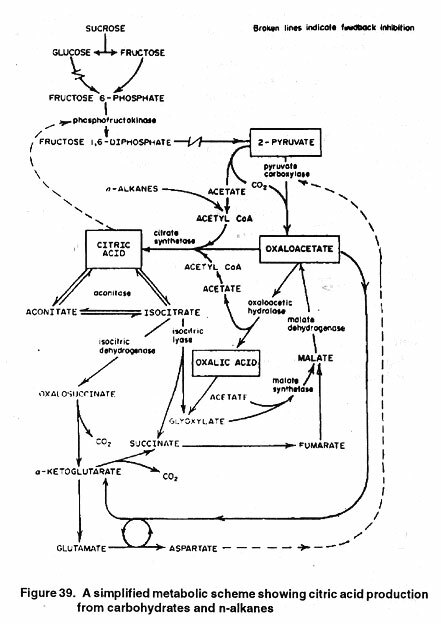 Figure shows the process that was used by the American Maize-Products Co. to produce lactic acid from glucose. The process may be used to produce technical or food grade acid. After the fermenter broth is filtered, activated vegetable carbon is used to bleach the calcium lactate for production of food grade acid. No carbon treatment is used for the technical grade. Next, the calcium lactate is evaporated to a 37% concentration at 70ÂºC and 0.57 atm. The concentrated lactate is then acidified with 63% sulfuric acid, and the calcium sulphate precipitate is removed by a continuous filter and sent back to the first filter which treats the fermenter liquor. The filtered acid is then treated with activated carbon from the filter cakes of the first, third and fourth carbon treatments. The carbon from this step is discarded. The lactic acid is then evaporated from 8 to 52% or 82% in 316 stainless steel evaporators. Technical grade acid is then diluted to 50% or 80% and treated with sodium sulfide to remove heavy metals if needed. Edible grade acid is diluted to 50 or 80%, bleached with activated carbon for a third time, and treatment with sodium sulfide to remove heavy metals. It is then bleached a fourth time with carbon before packaging. Other manufacturers have used fewer carbon treatments. Heavy metals could be removed by ion exchange which may also remove some of the amino acids present. Heavy metals can also be removed by the stoichiometric addition of calcium or sodium ferrocyanide to form insoluble ferrocyanide salts of the heavy metals. Whether or not this process is presently used is not widely known. Lactic acid may be recovered from fermentations utilizing cruder raw materials such as whey or molasses. Several grades of calcium lactate and lactic acid were produced from whey. The filtered liquor from the fermenters was treated with carbon first under slightly alkaline and then under slightly acidic conditions. The crude calcium lactate liquor was then evaporated under vacuum to a density of about 1.12 kg m-3. Technical grade acid was made from this liquor after evaporation, acidification, filteration of the precipitated calcium sulfate, carbon treatment and heavy precipitation. To make higher grades of product the liquor was cooled, crystallized and washed. The mother liquor and wash water were also cooled, crystallized and washed. The crystals were redissolved and similarly recrystallized as in earlier steps to create purer grades. Acids of different purity were made from the different grades of crystals by dissolution in water, acidification, calcium sulfate precipation filteration, evaporation, carbon treatment and heavy metals precipitation. Sheffield is currently making unit and a strainless steel double effect evaporator is used. Impurities are removed by filtration and carbon treatments. The hydration of the final product is controlled in the drying stage. Peckham describes a process for the purification of the lactic acid by calcium lactate precipitation. The fermenter liquor is filtered and evaporated to 25% lactic acid. The calcium lactate is then crystallized and separated from the mother liquor. The mother liquor can be used for technical acid. The crystals are made into acid by a series of treatments similar to those used by by Sheffield Products Co. These methods provide a product that is low is unfermented carbohydrates but may contain some ash which is mainly calcium sulfate. The crystals tend to form clusters and can be difficult to wash. The wash water and mother liquor contain high amounts of calcium lactate due to its high solubility, and must be recycled. Important costs in the purification process are related to the energy for water removal, losses in yield, and labor. The extration of lactic acid in to an immiscible solvent phase has been researched by many investigations. Lactic acid can be purified in this way from fermentations using crude raw materials. In all such processes the acid must first be extracted from the crude liquor by the solvent, and then recovered from the solvent by some means such as back extraction into water or distillation of the solvent-lactic acid mixture. The extraction solvent should have a low water solubility, a high distribution coefficient for lactic acid, and a low distribution coefficient for impurities such as the residual sugars. Scientist discusses some other desirable solvent properties. The distribution coefficient is defined as the concentration of lactic acid in the solvent phase divided by the concentration of lactic acid in the water phase. Extraction data for solvents with lactic acid and water and some data for solvents with crude lactic acid fermentation liquors are given. The effect of adding inorganic salts to the aqueous phase and the distribution coefficients of sucrose and lactose with several solvents was examined, who advocated the use of isopentyl alcohol as a solvent. 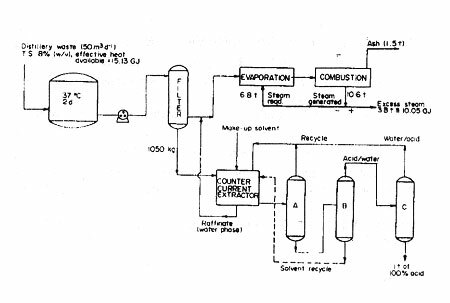 They included a flow sheet for their proposed process in which the lactic acid is recovered from the solvent by steam stripping. Croda Chemicals Ltd. has used a countercurrent extraction with isopropyl ether as the solvent. A description and blocky flow diagram of the process was published when the operation began. The fermentation liquor is filtered and then acidified with sulphuric acid; the calcium sulphate is filtered off. Next, the crude lactic acid is decolorized with activated carbon and then heavy metals, calcium and amino acids are removed by ion exchange. The acid is then evaporated under vaccum before it enters the countercurrent extraction columns. The acid is recovered from the solvent by countercurrent extration into water. Next, the acid is given additional activated carbon and ion exchange treatments as needed. Lastly, the acid is evaporated to its final concentration. The solubility of isopropyl ether in water is low and the loss of solvent is tolerable. Croda presently uses the same process expect that another solvent may now be used. Lactic acid refined by liquid - liquid extraction is substantially free from ash, but contains other impurities from the raw materials and needs additional treatment by activated carbon, oxidation and other means. High quality lactic acid, substantially free from residual sugars and other impurities, can be prepared by the esterification of lactic acid with a low molecular weight alcohol, distillation of the lactic ester, hydrolysis of the distilled lactate ester to yield the alcohol and lactic acid, and distillation of the alcohol from the regenerated lactic acid. A process involving methyl lactate was proposed by Hillringhaus and Helium is 1905 and by Byk in 1912. Sulfuric acid was used to catalyze the reaction in any excess of menthanol. An overall yield of 85% was reported. Filachione and Costello give details for a procedure to make lactic acid esters directly from ammonium lactate which is the crude fermentation product if ammonia or one of its salts is used to neutralize the acid during the fermentation. Schopmeyer discusses the operation of a commercial unit that was used to continuosly refine lactic acid by the distillation of methyl lactate. The product obtained was ash free and low in all other impurities. Corrosion of the stainless steel columns contaminated the product with iron. Ceramic equipment was found to be unsuitable because of frequent temperature changes and the strong acid. Problems were also encountered with gasket materials. Hydrogen cyanide may be obtained as a by-product from the propylene ammoxidation route to acrylonitrile, or from the reaction of ammonia and light hydrocarbons such as methane. Synthetic lactic acid made substantial gains when it was introduced to the market place because more importantly, the production of stearoyl-2-lactylates required a high purity, heat-stable lactic acid. The synthetic lactic acid contains no residual sugars and does not discolour significantly upon heating. Although by-products were used in synthetic manufacture in the past, lactic acid in now made starting from actaldehyde and hydrogen cyanide. Monsanto (USA) starts from actetaldehyde and hydrogen cyanide, whereas Mushashino (Japan) purchases the lactonitrile from another manufacturer. The lactic acid is purified by forming methyl lactate, distilling the ester, and then hydrolyzing the methyl lactate, Methanol, hydrogen cyanide and other impurities are removed by a combination of steaming, carbon treatment and ion exchange. The acid can also be recovered by solvent extration. Among these methods are the alkaline degration of sugars; the synthesis from carbon monoxide, acetaldehyde and water; the hydrolysis of chloropropionic acid; and the nitric acid oxidation of propylene, Synthetic means of preparation from a recemic DL Mixture of the stereoisomers. Rhone Poulenc (France) attemped large-scale production of lactic acid via the oxidation of propylene with nitric acid. It is generally believed, however, that this route is no longer being pursued because of safety considerations. Lactic acid is sold in technical, food and pharmaceutical grades, although most lactic acid meets the food and Pharmaceutical requirements. The most common concentrations are 88 and 50% lactic acid. Lactic acid concentration above 90% are difficult to pump and handle. The higher quality grades have lower concentrations of contaminants such as sugar, metals, chloride sulphate and ash. Fermentation grade acid generally contains some residual sugas and other impurities from the carbohydrates and nitrogenous nutrients used in the fermentation. Fermentation lactic acid generally has yellow colour which is darkest for the concentrated technical grade and a pale yellow for the food grade. A 'colourless', heat stable, pharmaceutical grade from fermentation derived acid is made by C.C.A. The corrosiveness and liquid form of lactic acid may present a handling problem for some users. Thus, some manufacturers supply a powdered form consisting of lactic acid on a calcium lactate base for uses that require a solid form. Aqueous solutions lactic acid are sold in plastic-lined tank cars and drums and in plastic carboys. Lactic acid finds medical applications as an intermediate for pharmaceutical manufacture for adjusting the pH of preparations, and in topical wart medications. Biodegradable plastic made of poly (lactic acid) is used for sutures they do not need to be removed surgically, and has been evaluated for use as a biodegradable implant for the repair of fractures and other injuries. The largest single use of high quality 'heat stable' food or pharmaceutical grade lactic acid is for the production of stearoyl-2-lactylates. Approximately 3.6 - 4.0 Ã- 10-6 kg y-1 and 5.0 - 6.0 Ã- 106 kg y-1 of lactic acid are used for this purpose in the US and the world, respectively. Most of this acid is produced synthetically, because residual sugar from the fermentation causes a caramelization colour, odor and flavour during the manufacture of the stearoyl-2-lactylates. Calcium stearoyl-2 lactylate (CSL) is used mostly in baking. CSL acts as a 'dough conditioner' by combing with the gluten in the dough, making it more tolerant to mixing and processing conditions as well as allowing a wider variation of bread ingredients. It also acts as a 'crumb softener' by complexing the starch in the flour which products baked produces with a softer texture. Sodium stearoyl-2-lactylte (SSL) behaves similarly to CSL and also act as an emulsifier as well. Both CSL and SSL help extend the shelf life of baked products. Sturoyl-2 lactylates are also used as starch conditioners in other food products such as dehydrated potatoes, and as emulsifiers in cosmetics and food products. Stearoyl-2-lactic acid is hard to handle and the lactylate moiety depolymerizes easily; however, a small amount is used in prepared food mixes. Lactylated fatty acid esters of mono = and di-glycerides such as glycerol lactopalmitate and glycerol lactosterate are used as emulsifiers in cake mixes, bakery products, liquid shortenings and cosmetics. Stearoyl-2-lactylates and lactylated fatty esters complete with other emulsifiers such as ethoxylated mono-and di-glycerides and succinylates monoglycerides. The principal competition in the US for stearoyl-2-lactylates for baking purposes is a combination of monoglycerides and ethoxylated monoglycerides. This combination is cheaper to use, but gives an inferior performance. In the rest of the world, diacetyltartaric acid esters appear to be used in preference to stearoyl-2-lactylates. Growth for these products has been projected to be about 2.5%. Lactic acid is mainly used directly as a food ingredient. Perhaps more than 50% of all lactic acid is used for this purpose. Both synthetic and fermentation derived acid are used for this purpose. Lactic acid is used as a food acidulent because it naturally occurs in many foodstuffs, has a mild acid taste, and has no strong flavours or odors of its own. Lactic acid is also used as a preservative, sometimes in combination with other food acids such as propanoic and acetic acid. As a food acidulent, lactic acid experiences competition primarily from citric, acetic and phosphoric acid and to a lesser extent from malic, adipic, fumaric, propanoic, formic and tartaric acid. Lactic acid is generally more expensive to use than other food acids, but it is sometimes preferred because it adds less of its own flavour to the food. Lactic acid is used in brines for processing and packaging foods such as olives, pickles and sauerkraut. Many cheese products sucha as cheese spreads, cold pack cheese, process cheese and cheese food contain lactic acid. Creamy salad dressings in both liquid and powder form often contain lactic acid. Some powder mixes for preparation of dips, sour cream and cheese cake contain lactic acid. A few meat products such as salami contain lactic acid. Lactic acid's use in soft drinks has been largely replaced by citric acid, phosphoric acid and other food acids in the US. It is still found in a few formulations such as pepper-type soft drinks. Lactic acid is used directly in the production of some rye and sourdough breads. It is also used in a few bakery products for its qualities as a preservative. The use of lactic acid in Jams, jellies, pie filling and packaged pectin powders has been largely replaced by citric, malic and fumaric acid in the US, although it is still used to some extent in Europe. Lactic acid completes with phosphoric acid for use in adjusting the pH of the water used for beer brewing. It is not used significantly for this purpose in the US, but is used to some extent in Canada, Europe and South America. Lactic acid buffered with sodium lactate is used in the production of confectionery products. Some animal feeds contain lactic acid. The use of crude ammonium lactate from fermentation as a potential animal feed supplement has attracted attention in recent years. Lactic acid is sometimes used in the production of wine. The market growth of food acidulents in general has been flat for several years and is expected to remain that way in the near future. The technical uses for lactic acid comprise a relatively small portion of the world's production. It is used in the manufacture of cellophane to control the pH in the film coating bath. It finds some uses in plastics for the production of phenol-formaldehyde resins, and can be reacted with alcohos and acids to make polyesters which are useful as plasticizer. It is used in treating metal surface the manufacture of rubber products, electrostatic painting, textile and paper printing the 'brightening' of silk and rayon, and textile dyeing. It was once widely used for the deliming of hides and in other parts of leather manufacture; however, it appears its use have been largely replaced by sulfuric and formic acids. It has potential for use in combination with other copolymer for the production of biodegradable plastics. Its use is likely to be limited to high-value, low-volume speciality plastics such as medical applications and the controlled release of pesticides unless the price of lactic acid is considerably lowered. Lactic acid is also used for the manufacture of some herbicides, fungicides and pesticides. Stereospecificity may have some advantages here as well as in some pharmaceutical products. The calcium salts of lactic are produced in a granular and powdered form. Calcium lactate trihydrate is used in pharmaceuticals primarily as a dietary calcium source and also as a blood coagulant for use in the treatment of haemorrhage and to inhibit bleeding during dental operations. Calcium lactate pentahydrate is used primarily to firm potatoes and other vegetables and fruits for packaging. Calcium lactate is also used to a small extent in baking powders. Sodium lactate is very hygroscopic and is typically sold as a 60% solution. It is used primarily an as electroyte replenisher in intravenous feeding formulations. It is also used in the production of some antibiotics and to buffer some pharmaceutical preparations. As a humectant, it is used for the production of cosmetics, personal care products, paper and tobacco. The world production of lactic acid salts is of the order of 106 kg y-1. Most of this is sodium lactate, followed by calcium lactate. Potassium lactate and metal salts of lactic acid are produced in much smaller quantities. Van Ness cites some applications for the metal salts of lactic acid. The alkyl esters of lactic acid find uses in pharmaceuticals, foods and industry. The ethyl and butyl lactates are used as flavour ingredients and for solvents. Ethyl lactate is also used as a tablet lubricant, in cryogenic greases, in the manufacture of pesticides and herbicides and in the manufacture of some anti-inflamatory drugs. Isopropyl lactate is also used for pesticides and herbicides. Alkyl lactates are also used in brushing and stripping lacquers, in printing inks and as flavours. The preparation of distilled alcohol spirits was first described in the 12th century. Extensive industrial use of ethyl alcohol began in the late 1800s with the growth of the synthetic chemical industry. Industrial alcohol has been valuable as a solvent, germicide, antifreeze, fuel and chemical raw material. Raw materials for fermentative ethanol production can be divided into three classicications by carbohydrate type : saccharine materials, starchy materials and cellulosics. Yeast (the primary organism used for ethanolic fermentation) will convert simple hexose sugar monomers (e.g. glucose and fructose) and some disaccharides (e.g. maltose and sucrose) to ethanol. The choice of raw material is critical as raw material costs typically make up 55-75% of the final alcohol selling price. Saccharine materials-with sugars available in fermentable form-require the least extensive preparation, but are generally the most expensive to obtain. Starch bearing materials and often cheaper but require processing to solubilize and convert the starch to fermentable sugars. Cellulosics can be available as cheap waste residue, but require the most extensive and costly preparation. Major saccharine raw materials are sugar cane or sugar beet juice, high test molasses, blackstrap molasses, fruit pulp and juice wastes, cane sorghum and whey. Blackstrap molasses, fruit wastes, sorghum and whey have alternate use as cattle feed components, and their prices are set primarily based upon feed value and shipping costs. Sugar cane and sugar beets are used for edible production and this sets their market value. Sugar cane juice is recovered by a milling train consisting of knife cutters followed by a pounding mil to rupture the cell walls and 3-5 high-pressure roller presses to express the juice. Crushed cane is hot water rinsed to aid sugar extraction between pressing cycles. Total water used is 25% of the weight of the cane and 85-90% of the fermentable sugars are extracted. The resulting juice is 12-16% sucrose sugar. The yield of sugar from cane is typically 125 kg per metric ton. A mascerated solid begasse residue (50% moisture) remains after sugar expression, and this can be used as a boiler fuel, resulting in a considerable economy in distillation and stillage evaporation fuel. Two kg of bagasse (dry weight), with a heating value of 19700 kJ kg-1 (8500 Btu lb-1), are produced for every kg of sugar. Sugar cane wax and aconitic acid can also be recovered as by-products. Cane crushers are high-pressure steam driven using from 1.0-1.2 kg steam per kg sugar recovered. Low pressure exhaust steam from the crushers is reused for distillation. Beet sugar is expressed by first slicing beets into V-shaped cossette wedges, followed by sugar extraction in continuous counter-current hot-water (85ÂºC) diffusers to produce a 10-15 wt% sugar solution. The cellulosic beet pulp residue is generally used as a low-grade cattle feed roughage valued at $130-220 per metric ton. Each metric ton of beets expressed produces 140-190 kg of sugar and 70-100 kg of pulp (dry weight). High test molasses is a concentrated sugar solution, allowing easy shipping and long-term storage. Sugar cane or beet juice is first partially hydrolyzed with dilute acid to convert sucrose to non crystallizable invert sugar monomers (glucose and fructose). The juice is then concentrated to 70-78 wt% sugar. Table 68 gives a typical composition of high test molasses. Owing to thermal decomposition of sugars during evaporation, and to the presence of small concentrations of yeast inhibitors, high test molasses sugars are generally only 95% fermentatble. Up to 1280 Ml y-1 of high test molasses, exclusively for alcohol production, was imported into the US between 1935 and 1942, when a sugar quota restricted sugar imports for human consumption. Except for such special circumstances, food use generally limits the availability of high test molasses for industrial purposes. Blackstrap molasses is the non crystallizable residue by-product of table sugar manufacture. The sugar juice is first treated with lime (0.75 kg per metric ton cane) at 100ÂºC to neutralize organic acids. On cooling, salts, coagulated albumen, fats and gums are precipitated. The clarified juice is concentrated to 60 wt% solids by multieffect evaporation and sucrose is precipitated by further evaporation in vaccum pans. After three or four evaporations, high viscosity prevents further crystallization. The sugars are primarily sucrose and non crystallizable invert mixed with the now concentrated inorganic salts and soluble non sugar organic residues retained from the juice or generated during evaporation (Table 68). Approximately 27 kg of blackstrap are obtained from every metric ton of can processed, and 2.51 of molasses (3.5 kg) is required to produce one litre of 95 wt% ethanol. Sweet sorghum is a tall grass with high sucrose content in the stems. It is widely grown for cattle forage. Sweet sorghum has received much attention because it can be readily cultivated under a wide variety of growth conditions and has a yield of sugar per hectare slightly higher than that found for sugar beets. After sugar expression, the cellulosic sorghum residue can be used as a cattle feed roughage source. Fruit cannery wastes can be used as a substrate for alcohol production. After orange, apple and pineapple juices have been squeezed, additional sugars can be extracted from the pulp by hot water diffusion. Pineapple canning yields excess juice, and in Hawaii up to 1.25 milion litres of juice required per liter of alcohol product. Ion exchange processes now allow the recovery of sugar from very dilute waste streams, and dilute cannery wastes could be used as an alcohol source while reducing the BOD of cannery effluents. Production from this sources will, of course, be limited, but does well illustrate the potential to integrate alcohol production into a waste disposal process, thereby producing a valuable product at very low raw material cost. Whey, produced as a by-product of cheese manufacture, is high (4.5-5.0%) in lactose. Lactose is a disaccharide composed of a glucose and a galactose unit and is not fermentable by most yeasts. The strains Torula cremoris and Candida pseudotropicalis readily ferment lactose to ethanol and this process has been used at many small installations since the 1940s. Ethanol production from whey is limited and must complete with use for whey in cattle feed and antibiotic production. Starchy raw materials include cereal grains, starch root plants and some cacti. The grains and root plants are all used both for human consumption and animal feed. The carbohydrate in the starchy in the starchy plants is not directly fermentable by yeast and these materials must be pretreated to hydrolyze the starch to simple sugars. Starch is first hydrated and gelatinized by milling and cooking, and then broken down to fermentable sugars by diastatic enzymes or weak acids. Capital investment for starchy material feed pretreatment can typically make up 15-20% of the total alcohol plant cost. The cereals contain valuable secondary products, and considerable further preprocessing may be employed to recover these prior to the fermentation to offset the high cost of cereal materials. Important cereal grains are corn, wheat, rice, barley and grain sorghum. Cereal grains are generally 50-65% starch and as high as 80% for rice. Corn is the major grain used for alcoholic fermentation in the US. Grain processing the traditionally been by batch method, but these are now often replaced by fully continuous processes. The grain is first air classified to remove dirt and cracked hulls. It is then ground (typically to 20-60 mesh) to allow easy wetting and then gelatinized by cooking. Traditional atmospheric pressure processes have been almost entirely replaced by pressure cooking. The higher temperature cooking allows reduced cooking time with less sugar degradation and 3-5% higher final yields. A coarser grind is allowable. Pressure cooking sterilizes the mash. Batch pressure cooking is by steam injection at typically 690 kPa (100 p.s.i. ), into horizontal pressure vessles of up to 40000 litre capacity with horizontal rake agitators. The mesh, with a grain concentration of roughly 0.27 kg per litre of water and pH adjusted to 5.5, is heated to 135-150ÂºC and held for 10-30 minutes. Rapid cooling by pressure blowdown and then vacuum evaporation reduces the temperature to below 65ÂºC for the addition of enzymes. Blowdown steam may be recovered for other uses. In the continuous cooking process, milled grain is first slurried with water in a stirred tank with a 1-5 min residence time. The slurry, again to roughly 0.27 kg grain per liter of water and pH 5-6, is continuously metered through a steam-jet heater into a cooking tube with a plug flow residence time of less than 5 min and at up to 180Â°C cooking temperature. Flash cooling is used to reduce rapidly the mash temperature and halt sugar breakdown. The continuous cooking process gives more uniform cooking at lower steam consumption and capital investment than the batch process. Traditional starch hydrolysis has been conduced using barely malt. Sprouted barely contains a high diastase activity. Ground dried barley malt is reactivated by slurrying with warm water (0.19 kg l-1). After 5 min the malt solution is mixed with cooled mash to achieve a ratio of typically 1 part malt to 10 parts other grain at 63ÂºC. Grain starch is composed of straightchained amylose and branched non fermentable dextrins. After 40 min, 75-80% of grain starch is converted to maltose, the remainder to limit dextrins. The mash is then fermented, with starch hydrolysis continuing. The conversion of maltose of ethanol during fermentation favours further breakdown if dextrins to maltose. Fermentation pH must be kept above 4.1 to maintain enzyme activity. For conventional grain fermentation itself, becomes the rate limiting step in fermentation. The continuous flow hydrolysis process is used in combination with continuous cooking. A reactivated malt solution is continuosly metered into the stream of cooked, cooled mash of 63ÂºC in a plug flow pipe reactor with a 2 min redidence time. The mash is then further cooled to fermentation temperature. The conversion of starch to maltose is reduced to 70%, but the obbreviated time results in reduced denaturation of the diastatic enzymes. Conversion of residual dextrins in the fermenter is faster and more complete with a 2% final alcohol yield increase typical. An alternative to barley malt is mold bran. Aspergillus oryzaeis grown on moist sprouting bran and produces amylase enzymes. The moldy bran can then be treated exactly as barley malt in carrying out the hydrolysis. Under some conditions, mold bran can be less expensive than barledy malt and 2% final alcohol yield increases are typical. Roots, tubers and cacti can all be very high in carbohydrate content, giving final alcohol yields per hectare higher than the cereal grains. High water content makes storage difficult and seasonal operation is required without costly drying to prevent spoilage. The protein content of these raw materials is low so that by-product recovery is not feasible and substantial by-product credits are not available to offset the raw materials costs. Materials used for alcohol production include potatoes, sweet potatoes, Jerusaleum artichoke, manioc and sotol. Processing for the roots, tubers and cacti are all similar. After water rinsing, the materials are cut or chipped and then hammer milled to a mash. Processing is then similar to the steps for grain cooking and hydrolysis. An exception is that special inulase enzymes are used for the hydrolysis like potatoes and sweet potatoes, mashing and cooking may be partly combined in the Henze cooker. Whole or chopped substrate is batch loaded into a vertical pressure cooker. After cooking, the mash is blown down through the conical vessel bottom into a lower-pressure drop tub with violent boiling resulting. This 'steam explosion' distintegrates the substrate, thus eliminating the need for milling. Conventional hydrolysis processes are then used. Compositions of several proposed cellulosic feedstock are summarized in Table 69. These materials are soft woods or woody agricultural residues and are made up of cellulose, hemicellulose and lignin bound into a structure which gives a plant its rigidity and support. Cellulose polymer can be hydrolyzed to its glucose monomer units for fermentation to ethanol. For every 1 kg of grain harvested, 1-1.5 kg of straw, cobs, stover or other residue are generated. Only one-third of three biomass is recovered as finished lumber. Cellulosics have received great attention as possible feedstocks on the assumption that raw material costs for agricultural and lumber waste materials should be negligible. Cellulose is far more chemically stable than starch and harsher acid hydrolysis conditions or more potent enzyme solutions are required for hydrolysis. Extensive pretreatment is often required to increase the accessibility of the cellulose which is otherwise well protected in its natural lignocellulosic structure. The cost of cellulose conversion to sugar is far higher than the cost of starch converstion. Yields are typically also much lower, requiring more raw materials and resulting in substantial waste streams requiring costly disposal. A special case is sulfite waste liquor, which is the residue of partial wood hydrolysis from paper pulp production. In this case a partial acid hydroysis is carried out to prepare a valuable bleached cellulose pulp and a dilute sugar solution is produced as an unwanted by product. After pretreatment to neutralize yeast toxins, this waste can be fermented to produce alcohol. This process must complete, however, with aerobic yeast feed production from the sulfite liquor which requires less capital investment and is more effective in reducing the BOD of the waste liquor in preparation for discharge. Few by-products of cellulose hydrolysis have proven high value, but there are promising possibilities. Lignin with a heating value of 29500 kJ kg-1 (12700 Btu lb-1) is readily utilized as a boiler fuel. Lignin is a complex three-dimensional polymer of phenolic origin, and potentially higher value chemical applications for lignin have been reviewed. Lignin can be used as a source of vanillin and syringic aldehydes, as an extender in phenolic plastics and as a lignin-formaldehyde binder for particle board, replacing, phenolformaldehyde. Most hydrolysis processes also break down the hemicellulose fraction of woody materials, producing xylose. Five-carbon sugars are not directly fermentable by ordinary yeast, but can be fermented by select bacteria to mixtures of either ethanol or butanol and organic acids. The further development of such methods to utilize xylose would greatly increase the yield of valuable products from woody materials, again improving the economics of their use. Alcohol is currently produced from sulfite pulping wastes at several large mills. The sulfite pulping process is a treatment to remove hemicellulose and delignify wood to produce a clean cellulose fiber pulp for paper or rayon manufacture. Wood chips are pressure cooked at 140ÂºC with an aqueous solution of sulfurous acid containing calcium, ammonium or magnesium cation to provide 5-7% free sulfur dioxide. The dilute acid hydrolyzes hemicellulose almost completely to its monomer pentose sugars and renders lignin soluble by sulfonation. The cations neutralize the strong lignosulfuric acids to prevent excessive degradation of the cellulose. Amorphos cellulose. Amorphous cellulose, however, is hydrolyzed to glucose which can be fermented. After blowing down to atmospheric pressure, the liquor is screened or pressed from the cellulose fibers and the fibers are than washed in counter current flow. The resulting sulfite waste liquors contain 8-12% dissolved solids-organic decomposition products equal to almost half the weight of the original wood, in addition to the inorganic pulping chemicals. Sugars make up typically 20-30% of the dissolved solids. The proportion of fermentable hexose sugars is highest for soft woods and harsh pulping conditions and can reach up to 70%. For each metric ton of finished pulp produced, 4000-6000 of waste liquor is generated. Free and loosely combined sulfur dioxide is present at 5-15 g l-1. Sulfur dioxide in low concentrations reduces ethanol yield by increasing acetaldehyde production. At the high concentrations present in raw waste liquor, it is completely toxic to yeast. Early plants used direct addition of lime to neutralize sulfurous acid and simultaneously precipitate a portion of the lignosulfonic acids to detoxify the liquor for fermentation. Modern plants steam strip the liquor with 0.06 kg steam per of liquor in a roughly 20-stage column. 10 kg of sulfur for recycle to the pulp digesters is recovered per metric ton of liquor and this offsets the steam cost. A final lime neutralization (with approximately 0.4 kg lime per 1000 liquor) is used to precipitate organics and adjust the pH. A major drawback to the use of sulfite waste liquor is the low concentration of fermentable sugars-only 2-3 wt%. Evaporation prior to fermentation is impractical due to salt deposition problems in heat transfer equipment. Sugar bearing waste liquor can be recycled to the digesters to increase the sugar concentration of the subsequent liquor recovered. Upto 55 g l-1 of sugar have been obtained in small scale experiments, but sugar degradation to sugar sulfonic acids and bisulfite addition compounds is increased. Molasses has been added to sulfite liquor in the one US plant to increase the final alcohol product concentration and simplify distillation. If none of these methods are employed, then very dilute 1-1.5 wt% ethanol solutions are obtained from fermentation and special distillation methods must be employed to prevent extremely high separation energy requirements. Distillation is also complicated by the presence of increased levels of fermentation by-products-fusel oils, borneol, limonene, camphene and organic acids. Depending on the initial pulping conditions, 65-103 litres of ethanol can be produced per metric ton (15-25 gal per US ton) of pulp manufactured. An important aspect of ethanol production from sulfite waste liquor is its role in waste disposal. Alcohol production reduces the liquor biological oxygen demand by 45-50%. Growth of cattle feed yeast competes with use of the sulfite liquor for ethanol manufacture. Aerobically grown Torula and Candida feed yeast can consume acetic acid and pentose sugars as well as hexose sugars; 95% of all reducing sugars are typically consumed with a 60% overall reduction in BOD. Depending on design, fermentation equipment makes up 10-25% of the total fixed capital cost of an ethanol plant. Further, the fermentation process, by dictating feed sugar concentration and product cell and ethanol concentrations, specifies the major flows and concentrations throughout the reminder of the plant. The fermentation process, thus, is central to the overall plant design. Yeast are the only organisms currently used for large-scale industrial ethanol production. Yeasts produce ethanol with very high selectivity (only traces of by-product), are very hardy and are large compared with bacteria (allowing simplified handling). Yeast strains are generally chosen from among Saccharomyces cerevisiae, S. ellysoideus, S. carlsbergensis, S. fragilis and Schizosaccharomyces pombe. For whey fermentation, Torula cremoris or Candida pseudotropicalis is used. Yeasts are carefully selected for : (1) high growth and fermentation rate ; (2) high ethanol yield; (3) ethanol and glucose tolerance; (4) osmotolerance; (5) low pH fermentation optimum; (6) high temperature fermentation optimum; (7) general hardiness under physical and chemical stress. High growth and fermentation rate allows the use of smaller fermentation equipment. Ethanol and glucose tolerance allows the conversion of concentrated feeds to concentrated products, reducing energy requirements for distillation and stillage handling. Osmotolerance allows the handling of relatively 'dirty' raw materials such as blackstrap molasses with its high salt content. Osmotolerance also allows the recycle of a large portion of stillage liquids, thus reducing stillage handling costs. Low pH fermentation combats contamination by competing organisms. High temperature tolerance simplifies fermenter cooling. General hardiness allows yeast to survive both the ordinary stress of handling (such as centrifugation) as well as the stresses arising from a plant upset. Batch fermentation begins with the production of an active yeast inoculum. This can be either by the conventional serial growth method or by the rapid semiaerobic method. Aseptic techniques are used throughout. In the serial growth method a pure culture inoculum from an agar salnt is used to seed a laboratory shake flask. At the peak of growth (!2-24 h) this culture is used to seed a succeeding culture 30-35 times larger. This is repeated, generally through three laboratory stages and two or three plant semiworks stages, to produce the final-2-5 vol% inoculum for the primary fermentation. The inoculum is grown on a medium similar to the final fermentation mash to minimize acclimatization time in the final fermenter, but higher level of yeast growth nutrients may be used to produce a high cell density (typically 150 billion cells l-1). Cylindro-conical Nathan vessels are preferred for fermentation as these promote better circulation and allow thorough drainage for cleaning. For very large plants, slopedbottom cone-roof tanks of up to 1 million litres volume are used and these large vessels are often agitated only by carbon dioxide evolution during fermentation. After emptying and rinsing from the previous batch, mash at 13-17 wt% sugar is pumped to the fermenters. Once 20% full, the inoculum is added to allow growth during the remainder of the filling cycle, which can last 4-6 h.
Fermentation temperature is regulated by circulating cooling water through submerged coils, circulating the mash through external heat exchanges, or simply spraying the vessel walls with cool water (adequate for small fermenters only). The feed is generally introduced at 25-30Âº C, and the temperature allowed to gradually introduced at 25-30 C, and the temperature allowed to gradually rise as heat is evolved. The temperature thus varies from 30-35ÂºC during the initial period (which is optimal for yeast growth). Cooling is then used to prevent the temperature from exceeding 35-38ÂºC, which is optimal for ethanol production. These temperatures may be modified depending on the yeast strain used. Stillage backset provides excellent buffering. The pH is set initially at from 4.5-5.5 and decreases only slowly, generally holding at pH 4.0 or above. This is especially important for fermentation of grain mashes with simultaneous dextrin hydrolysis, as many amylase enzymes are rapidly denatured at lower pH. 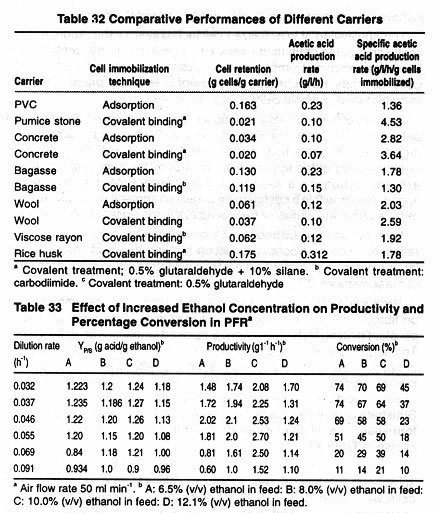 The ethanol production rate is the product of specific (per cell) productivity and the concentration of cells. Initially, the rate of alcohol production is quite low, but as the number of yeast cells increases the overall rate increases, and with rapid carbon dioxide evolution the beer appears to boil. After 20 hours a maximum in ethanol productivity is reached. The effect of reduced sugar concentration and ethanol inhibition then become important. The fermentation continues at a decreasing rate until, at 36 hours, 94% of the sugar is utilized and a final ethanol content of 69 g l-1 is achieved. The average volumetric ethanol productivity over the course of the fermentation is 1.9 gl-1 h-1. Fermentation time will vary depending on yeast strain and substrate. Hawaiian and Cuban blackstrap molasses fermentation usually requires 36 h. Molasses from Java may require as long as 72 h. These times are reduced when molasses clarification is used. Grain fermentation requires 40-50 h to allow complete residual dextrin converstion. 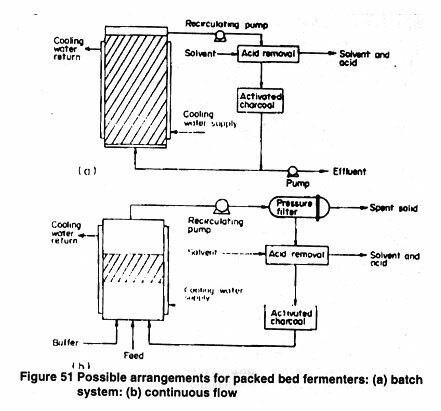 A batch fermentation layout incorporating teamed heat exchange and chemical sterilization systems is shown in Figure 84. The Biostil process (Figure) is a modification of the continuous fermentation process with recycle, whereby the fermentation and distillation are closely coupled and a very high stillage backsetting rate is used. Fermenter beer is continually cycled (through a centrifuge for yeast recycle) to a small rectifying column where ethanol is removed. The majority of the ethanol depleted beer (with residual sugars and non fermentables) is then recycled to the fermenters. The yeast cell density is maintained at 500 billion cells per liter. The fermenter ethanol concentration can be maintained at any desired non-inhibitory level by adjustment of the beer cycle rate. The large liquid recycle provides an internal dilution so that very concentrated feeds can be processed. Liquid flows external to the recycle loop are greatly reduced. Less water is consumed and a more concentrated stillage is produced. The flow rate capacities of most auxiliary equipment can be substantially reduced. Extensive heat exchange is incorporated into the beer cycle loop to maintain energy efficienty. As bacteria are not well separated by the centrifuge, the cycling through a hot distillation stage also provides a continuous pasteurization and infection risk is reduced. As with the Melle-Boinet process, ethanol yield is increased by cell recycling. With ethanol inhibition overcome, the Biostil process is limited instead by the build-up of toxic non fermentable feed components and fermentation by-products. In pilot plant studies the stillage flow could be reduced by a factor of 20 for concentrated cane syrup, but only a factor of 3 for blackstrap molasses with its high non fermentable content. The process can also be applied to prehydrolyzed starch feeds. Alcohol product recovery is energy intensive, typically accounting for more than 50% of the total fermentative ethanol plant energy consumption. When heat form burning of raw material residues (such as bagasse) is not available, this constitutes a significant operating cost. Depending on recovery system design, recovery equipment cost generally makes up 6-12% of the plant total capital investment. For higher quality alcohol, the three-column Barbet system was commonly employed (Figure). In this system the stripped beer is first purged of most aldehydes in a purifying column which then feeds a relatively dilute alcohol stream to a stripper-rectifier. The alcohol product is taken as a side draw a few plates below the head of the rectifier. A small purge of additional aldehydes from the head of the rectifier is recycled to the purifying column. Fusel oils are tapped from the lower plates of the rectifier, and in some cases an additional fusel oil concentrating column was employed. The energy consumption for the four column system is 4.1 kg of steam per liter of 94 wt% alcohol and the product is still contaminated with traces of aldehydes. 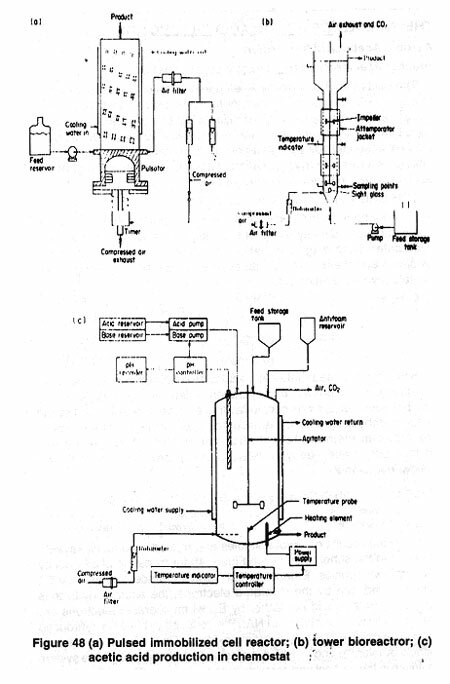 In the 1930s an alternative three-column Othmer system incorporating vapor reuse methods to reduce steam consumption was developed (Figure). A third aldehyde stripping column is added to the basic two-column design. The product alcohol side draw from the rectifier is fed to the top plate of the aldehyde column and, in descending, is stripped of volatiles to produce an essentially pure azeotropic alcohol bottoms product. Aldehyde carrying vapors from the head of the aldehyde stripper are returned to the rectifying column and a technical grade heads alcohol product is tapped from the rectifier reflux to purge the aldehydes as in the simple two-column design. The main product is virtually free of aldehydes and is of higher quality than the Barbet system product. Heat for alcohol vapor boil-up in the aldehyde stripper reboiler is provided by condensation of a portion of the stripper vapor product, which is then returned to the stripper as reflux to reduce the stripper tray requirement. This reuse of heat increases energy efficiency and the steam requirement is not increased over the simple two-column design (2.4-3.0 kg per liter of 94 wt% product). 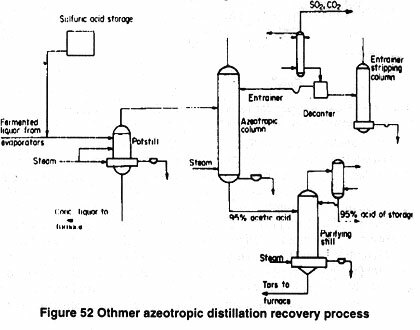 Azeotropic distillation is today the prevalent method for ethanol dehydration to exemplary (Figure). Water is only slightly soluble in nonpolar benzene, while ethanol is freely soluble. The vapor pressure of water over a benzene/ethanol/water liquid mixture is thus greatly enhanced relative to the ethanol. In the distillation the ethanol/water mixture is fed at a midpoint in the column while an organic-rich phase (75 mol% benzene decanted from the cooled distillate) is used as reflux at the column head. Benzene concentrates in the liquid phase on the plates above the feed, enhancing the volatility of water and forcing it into the rising vapor phase. Ethanol concentrates benzene/ethanol/water ternary azeotrope (24% ethanol, 54% benzene, 22% water is taken as the column head product. Blow the feed tray, benzene is stripped from the ethanol and anhydrous ethanol is recovered from the azeotropic column reboiler. The distillate of the azeotropic column, when cooled and decanted, separates into two phase the organic-rich phase used for reflux and a water-rich phase (35% ethanol, 4% benzene, 61% water) which is treated in the benzene recovery column. This column produces the benzene concentrated azeotrope as head product. The dilute alcohol can be reconcentrated in an additional column or recycled to the primary alcohol recovery column. The distillation columns are costly as the azeotropic column alone requires 50 plates and is of similar diameter to the primary stripper rectifier. Anhydrous alcohol is generally refined from 94 wt% azeotropic alcohol. The additional steam requirement for anhydrous alcohol production with benzene as the entrainer is then 1.0 kg of steam per liter of product. Waste treatment and by-product recovery are extremely important factors in the economics of ethanol production. Without backset, typically 10-15 of stillage are produced for every liter of alcohol product. Corn stillage has a waste biological oxygen demand of 15000-25000 p.p.m. and a single 100 MI y-1 plant thus generates a pollution load equivalent to a city of 1.4 million inhabitants. Balancing this, stillage can be treated to become a valuable by-product. For corn, the treated stillage can be sold for a credit equal to 52% of the cost of the original corn. Fusal oil, aldehydes and carbon dioxide can also be recovered as valuable by-products. This section follows closely the recent review by Maiorella et al. (1983c). Table 70 compares typical properties of stillage from fermentation of blackstrap molasses. Nutrient (protein and vitamin) content is highest for corn stillage containing corn protein residue from the germ and bran which are largely unaffected by the fermentation. Blackstrap molasses stillage is second highest in nutrient value with less protein than corn stillage, but high vitamin content. Mineral (ash) content is also high. Cane and beet juice stillages are similar in nutrient make-up to blackstrap stillage, but with lower nutrient concentrations. Potato stillage and cornstarch stillage (from distilleries with complete corn germ and bran removal prior to fermentation) are low in nutrient vaule. Sulfite liquor and wood hydrolyzate stillage are low in protein and vitamin nutrients but high in BOD, primarily as pentose sugars. Figure 90 shows the process for cattle feed production from corn stillage. Bulk solids are removed by centrifugation or by screening followed by dewatering in a rotary press. These solids then are dried to less than 5% water in rotary driers to produce the distiller's light grains product. The pressed liquid think stillage is concentrated to 35% solids in forced convection vertical tube evaporators and then dried to a power using drum or spray driers, yielding distiller's solubles. Alternatively, the concentrated liquid solubles can be blended back with the pressed solids and these rotary together to produce distiller's dark grains. About 700-900 g of stillage feed can be recovered per liter of alcohol produced. The feed value of corn stillage is similar to that of soybean (Table 71) and corn stillage is valued at approximately 95% of soybean cost for use in cattle feed. The corn stillage cattle feed process recovers all the stillage solids, leaving no waste stream for further processing. The evaporation energy load to achieve this is, however, very high and a conventional plant may use as much steam for stillage drying as for alcohol distillation. Molasses stillage (vinasse) is lower in suspended solids content than corn stillage, and the yeast may be recovered as a valuable by-product by simple centrifugation. The stillage is high in vitamin content. For use as cattle feed, molasses stillage is evaporated to typically 50-65 wt% solids (sufficiently concentrated to prevent spoilage) and marketed as condensed molasses solubles or 'vacatone'. Feeding tests show that the concentrate has roughly 65% of the nutritive feed value of molasses and it is widely used as a molasses feed substitute. Based on protein and carbohydrate content, the value of condensed molasses solubles at 65% solids has been estimated as much as $99 per metric ton. Cane and beet juice stillage may be treated similarly to molasses stillage. Alternatively these stillages may be mixed with bagasse fiber or beet pulp residue and dried to produce a nutrient enriched roughage feed. The soluble nutrient content of corn starch, potato and sulfite waste liquor stillage is not sufficient to justify the high cost of evaporation. For these stillages the yeast may be recovered by centrifugation and then spray or drum dried. Secondary treatment is required to reduce the stillage pollution load. Industrial ethanol end uses may be categorized into three classes; solvent, chemical intermediate and fuel. In each of these applications, fermentation ethanol must compete with petroleum derived ethanol as well as with alternative commodities. The extent of ethanol use and the mix of fermentative vs. petroleum derived ethanol as well as with alternative commodities. The extent of ethanol use and the mix of fermentative vs. petroleum derived ethanol varies substantially throughout the world. The fermentation route is the more prevalent in less industrialized nations. Alcohol production can begin in relatively small capacity plants which can then serve as a first step toward a diversified chemical industry. The Union Carbide Corporation in the US established a large chemical business in the 1930s, producing over 70 chemicals based on ethanol. Today, both India and Brazil are expanding their chemical industries based on fermentation ethanol and Brazil is now actively marketing its enthanol technology to other less industrialized nations. Fermentative ethanol has remained important in Belgium, Italy, France and the Netherlands, and is growing in Japan. Ethanol ranks second only to water as an industrial solvent. Solvent applications include resins, pharmaceuticals, cosmetics, household cleaning products and industrial solvents; 50-55% of industrial (nonfuel) alcohol use is for solvent applications, as summarized in Table 72 for 1975. Solvent usage is mature with few major new applications emerging and a slow growth rate of 2-3% per year is expected. Figure summarizes several of the more important chemicals that can be derived from ethanol. More exhaustive listings along with reaction details are presented in several sources. A new process allows the production of a hydrocarbon mixture similar to high-octane gasoline using a shape-selective zeolite catalyst. Thus there is the potential to produce practically all petroleum derived chemicals from ethanol. In the US, butadiene production for synthetic rubber led to the tremendous growth in the ethanol fermentation industry during World War II. After the war, petroleum replaced ethanol as the raw material for butadiene. Acetaldehyde became the major intermediate based on ethanol with a maximum production of 568 million litres in 1963. A direct route to acetaldehyde from ethylene was then developed and acetaldehyde production from ethanol was reduced to 87 million litres in 1975. The trend to replace ethanol as a chemical intermediate has continued and in 1981 the major chemical products from ethanol were esters, amines and ethers. Summarized by Anderson. Production is expected to grow, with 1 billion litres to be consumed for chemical synthesis in 1985 vs. 56 million liters in 1975. See table 73. Fuel use in internal combustion engines is the fastest growing application for fermentative ethanol. The original Otto engine was developed using anhydrous ethanol fuel. Ethanol use in blends of up to 20 vol% with gasoline was widespread during World War II induced petroleum shortage. As eary as 1931, Brazil legislated the use of a 5 vol% alcohol blend with gasoline as a means to utilize sugar refinery molasses waste and to stabilize sugar prices.